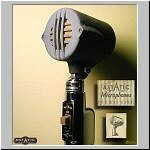 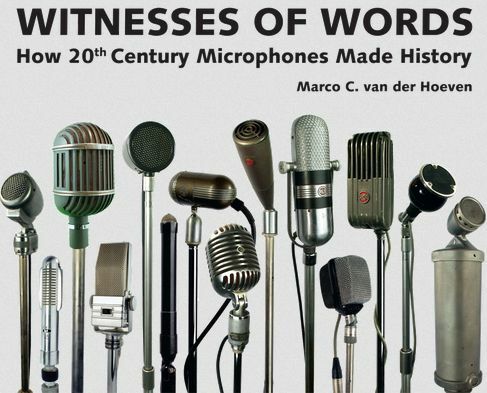 My fellow Dutch collector of vintage microphones, Marco van der Hoeven, has published this wonderful book with lots of info and excellent photos of many vintage microphones, all from his personal collection. 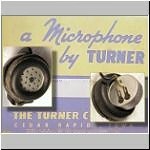 The book is a must for anyone who loves vintage microphones, it is bound, hard cover and printed on thick, high quality paper. 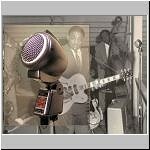 Click on the picture or here to go to his website and order the book ! 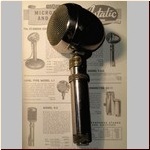 A small dynamic microphone from Japan. 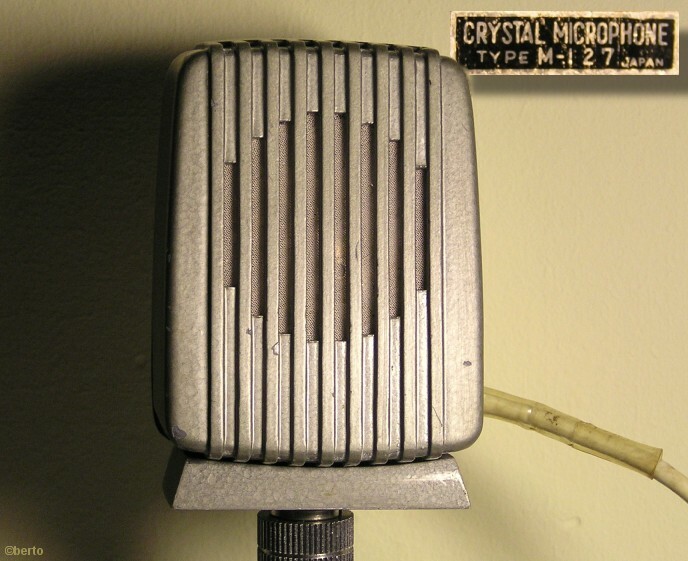 A crystal microphone from Japan, with a large Aiwa element. 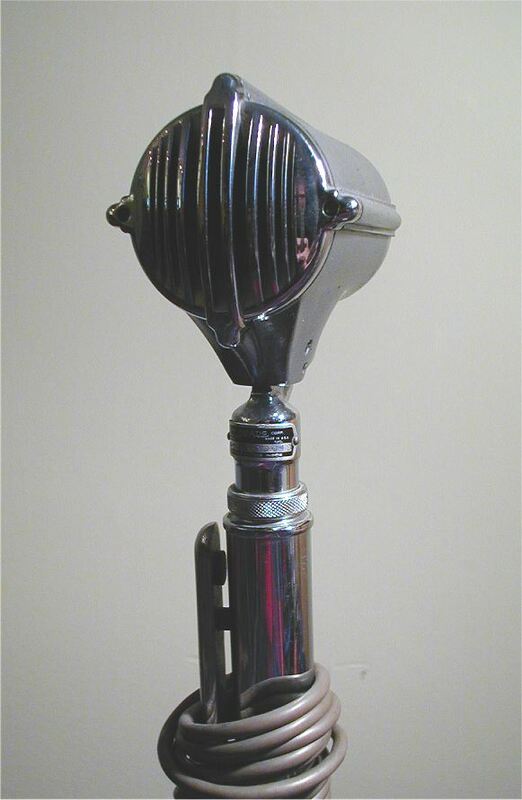 Crystal hand-held microphone, introduced late 1930's. 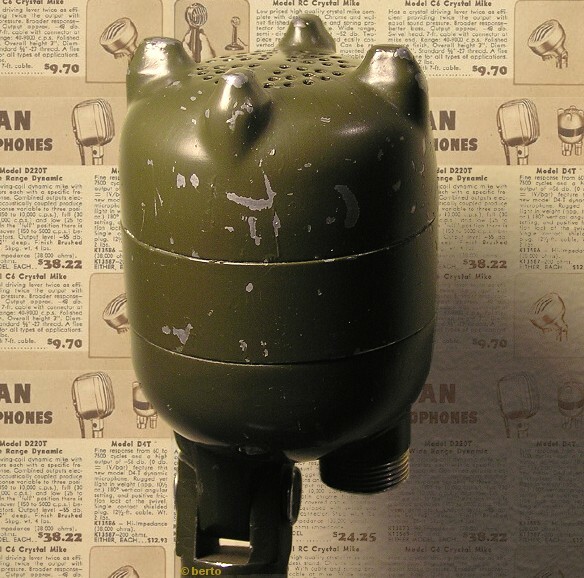 This is probably a military version (green paint, no label, M2/U type) of the better known D4T. 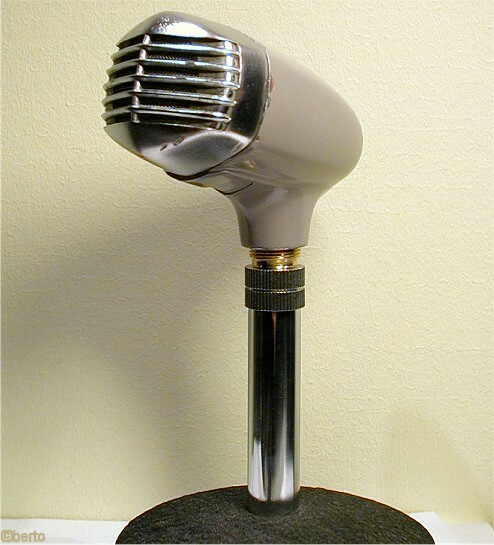 This model is one of the microphones that are nicknamed the "Salt Shaker". 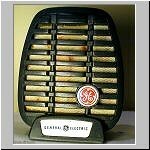 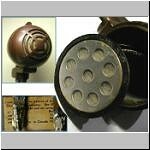 It was introduced around 1939, its frequency range is given as 60-7500 Hz. 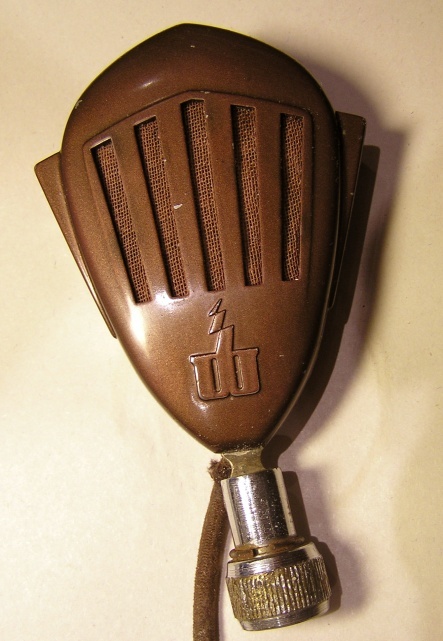 The D4 (without a Transformer) had an impedance of 30 Ohm. 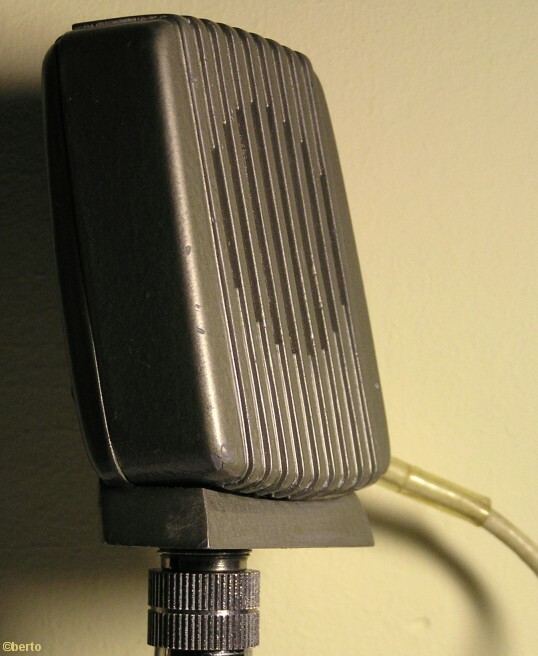 The single contact models have a high impedance (38000 Ohm), the models with 200 or 500 Ohm had a balanced line output connector. 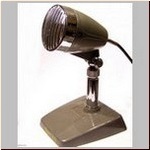 1940's list price: $12.00 (High-Z) $11.00 (Low-Z). 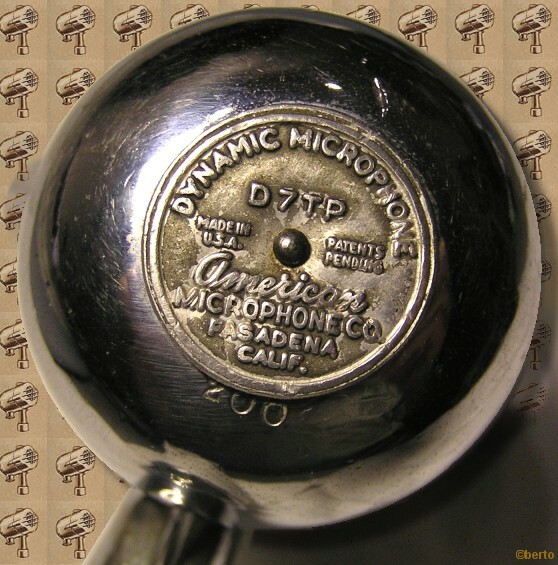 Also known as PG (Pressure Gradient) microphone. 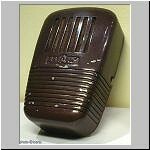 Has an elipsoid pick up pattern. 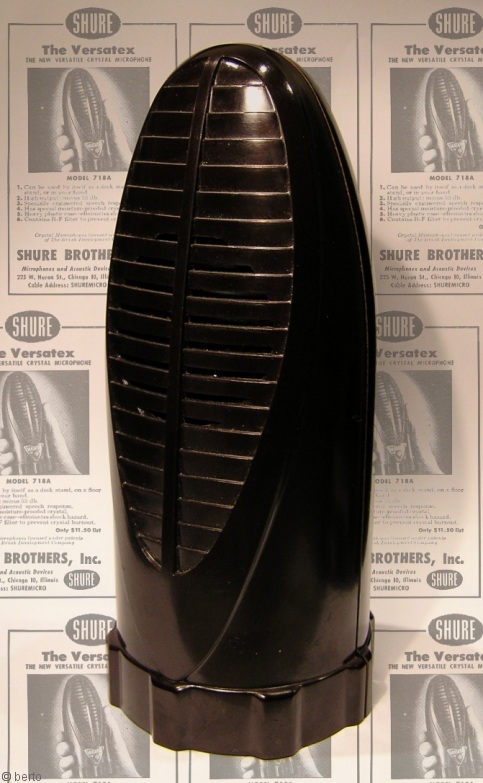 I am not sure if this one has the original element, this one has a Shure controlled reluctance element inside, possibly one of the older models (99G86 / R5 see the Vintage Blues Harmonica Microphone Museum ). 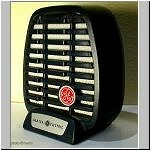 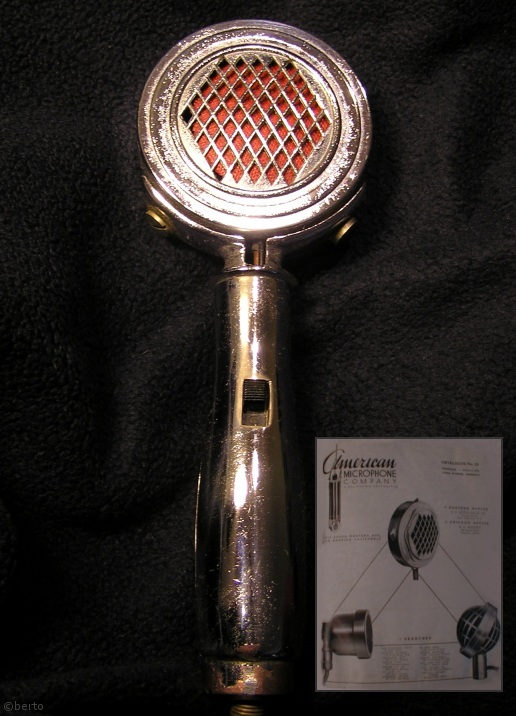 The classic harmonica microphone. 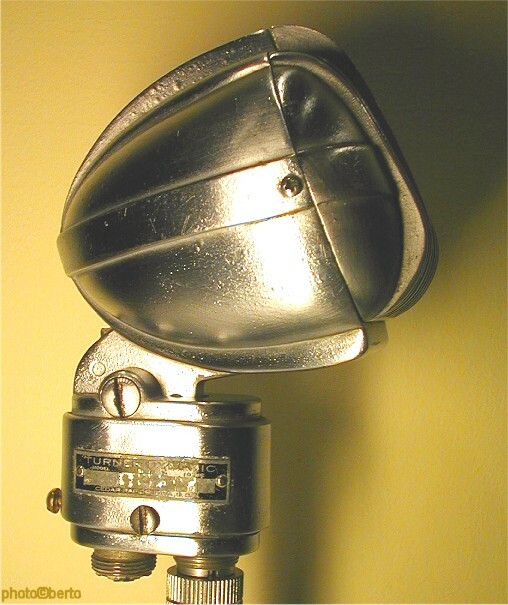 The original design was made in the 1940's, this one is much newer (around 1982). 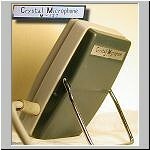 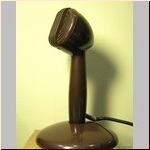 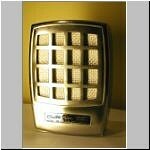 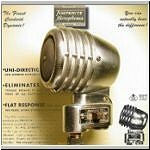 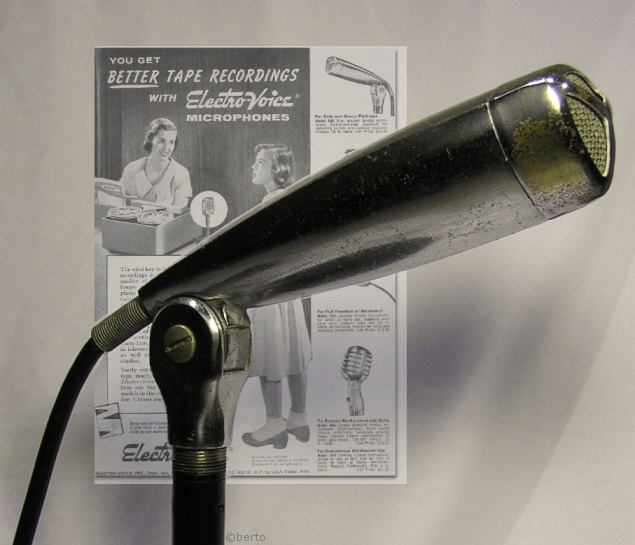 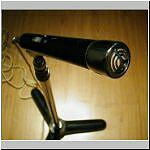 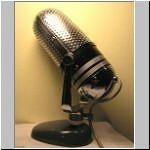 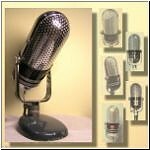 "Very popular for amateur, public address and home recording"
1950's list price: $16.95 (Crystal) $16.15 (Ceramic). 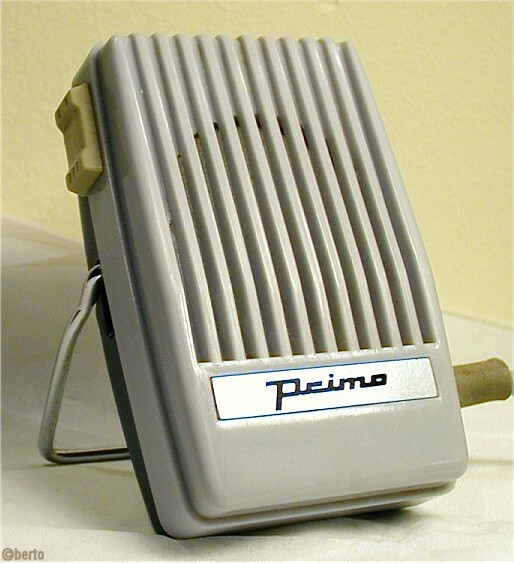 The JT-40 was similar but had a rising frequency characteristic. 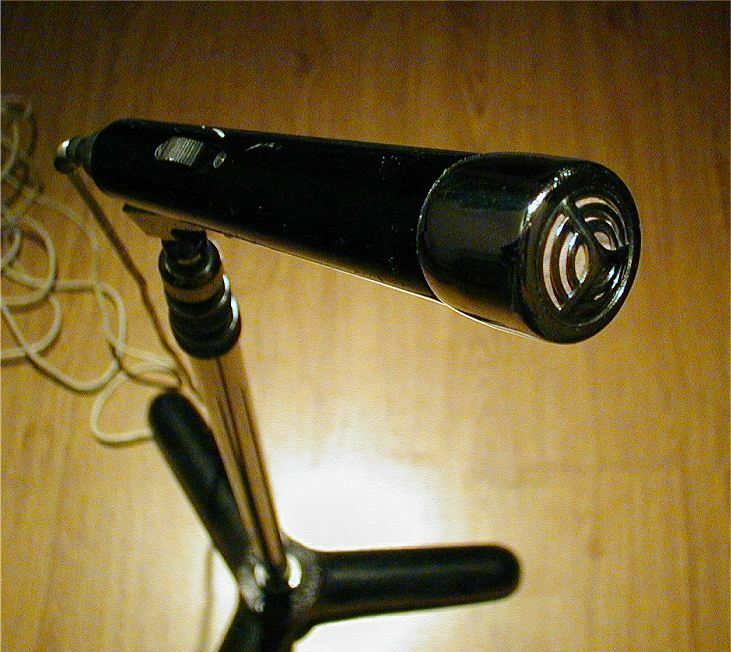 A dynamical microphone on stand. 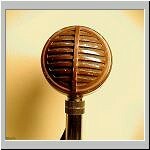 Also known as the "Commentator". 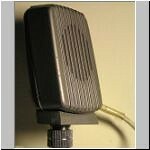 "Rugged all directional high impedance mike"
The DN-50 was a 50 ohms model, the DN-MZ was a multi-impedance version. 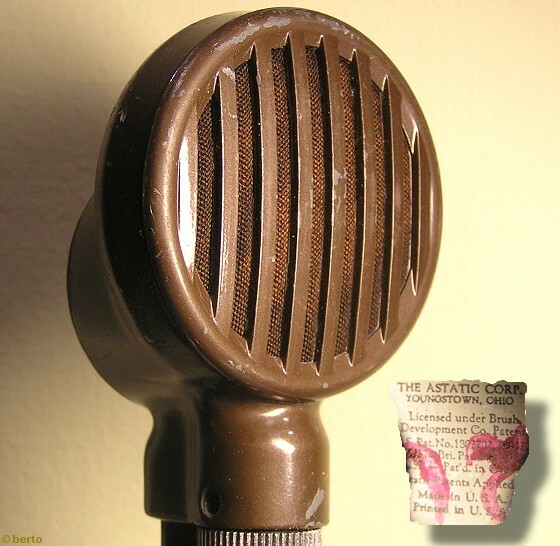 The name "Cardinal" is mentioned in an old advert at the great phantomprod site. 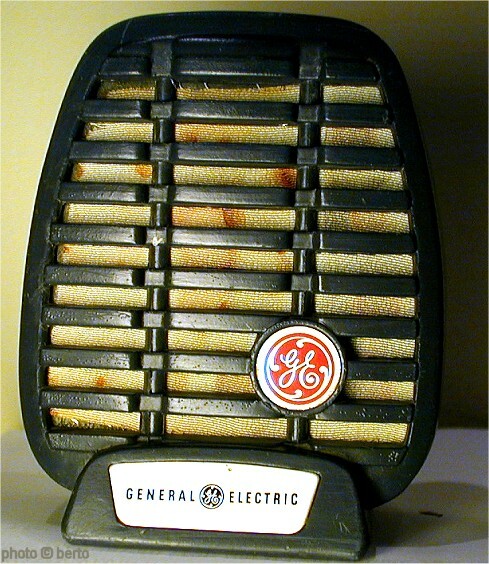 1954's list price: $ 9.75. 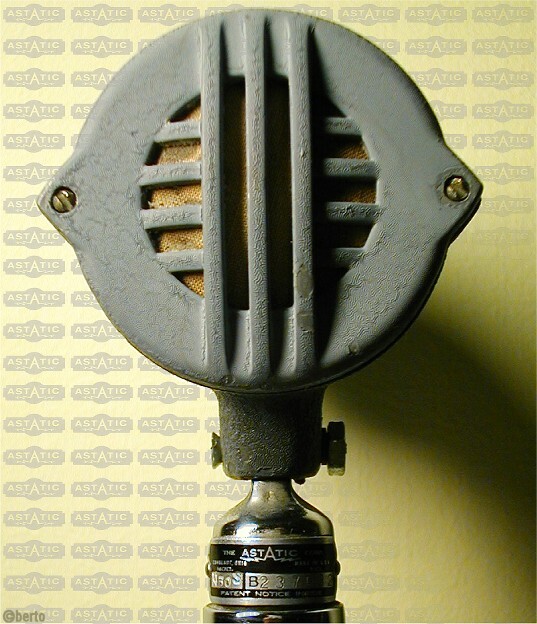 1952's list price: f 50.50 (in the Netherlands). 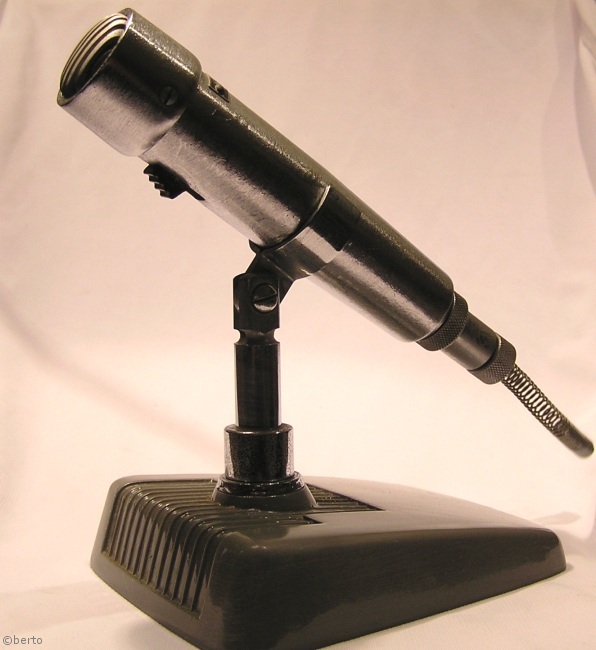 There was also a plastic base stand available. 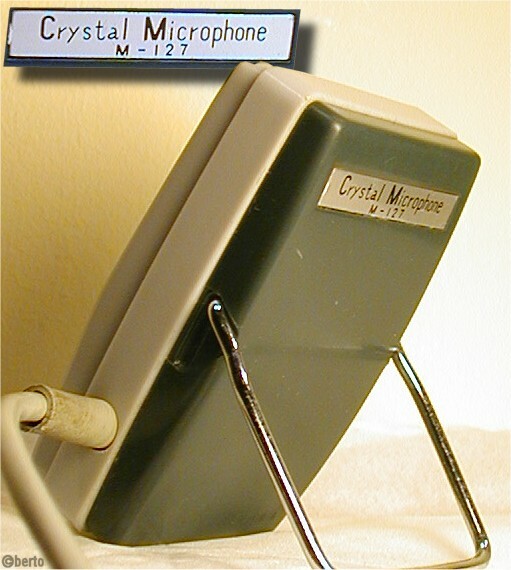 Crystal microphone. 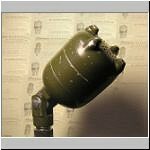 Not very rare, although it I have never seen it displayed in one of the Astatic catalogues. 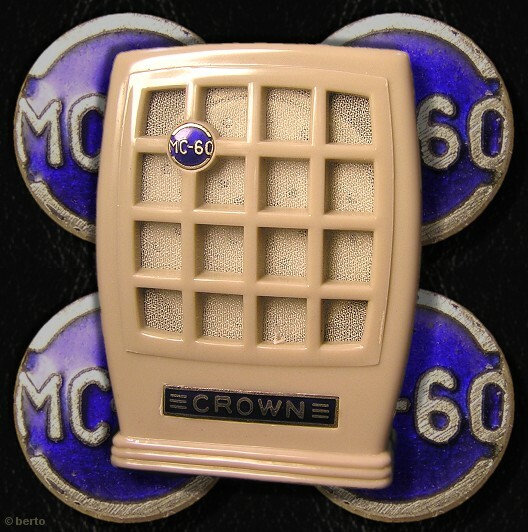 There is no name plate, so most people refer to it as the 'Brown Biscuit'. 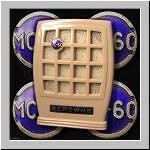 One website gives it's name as'Model 60'. 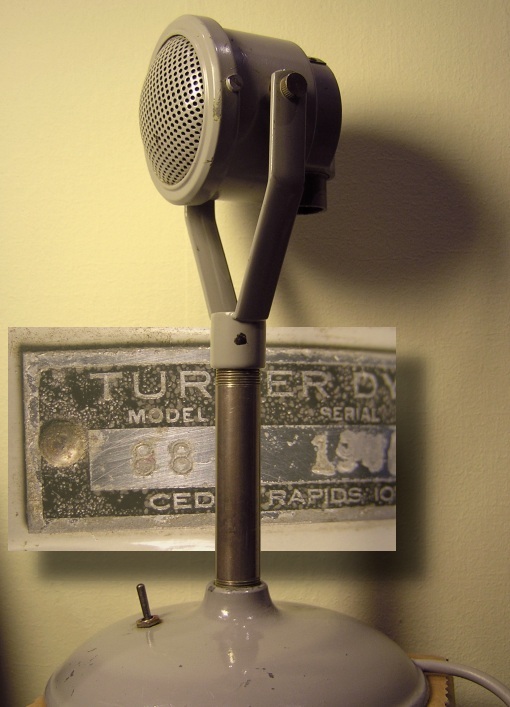 This microphone is more common under the name T3 or M3. 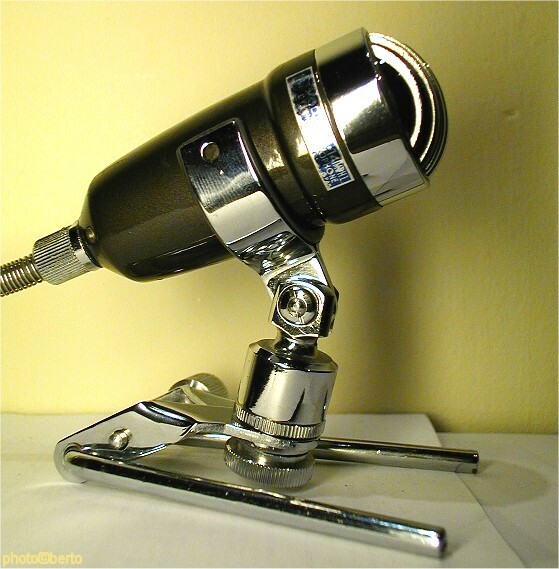 I have no idea what the difference is between this RD3 and the T3 models, as far as I can tell they are identical on the outside. 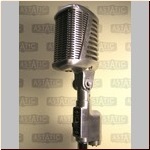 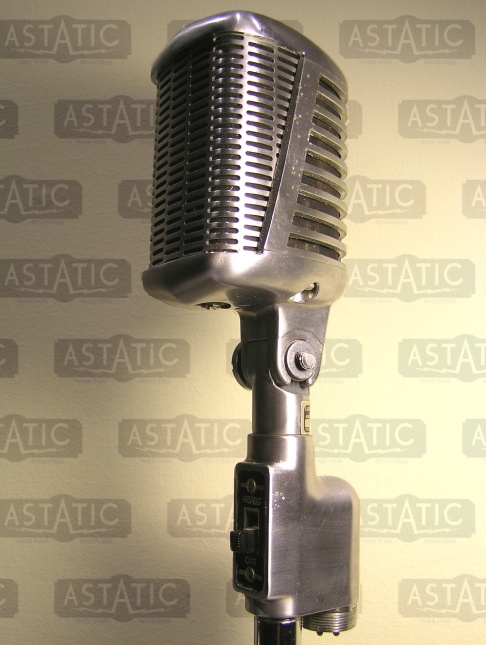 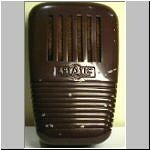 Acording to the Vintage Blues Harmonica Microphone Museum page this model is quite rare and was only manufactured by Astatic Canada (in Toronto). 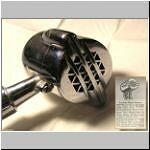 It has a wooden handle (not shown here) and of course a crystal element. 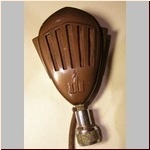 Late 1930's or early 1940's. 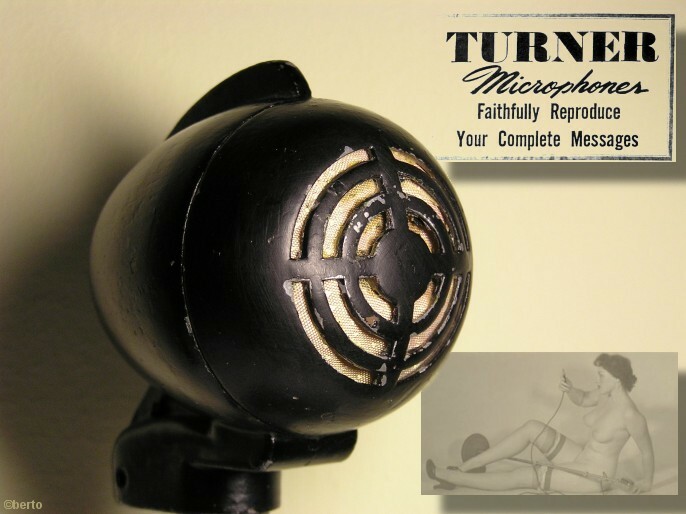 Dynamic cardioid microphone. 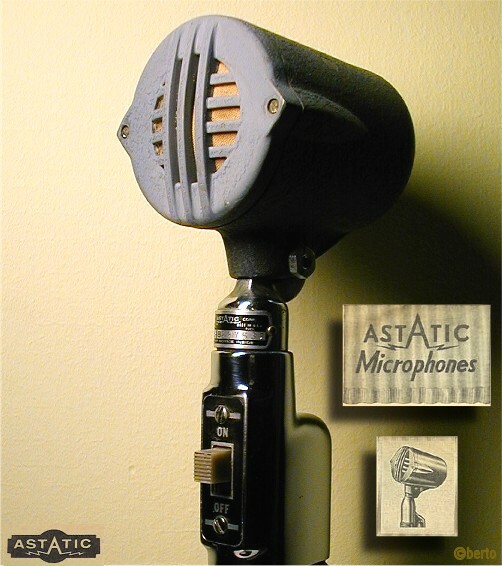 This is a Canadian Astatic (Toronto). 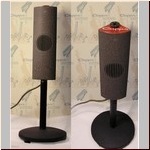 1960's list price: $ 48.00. 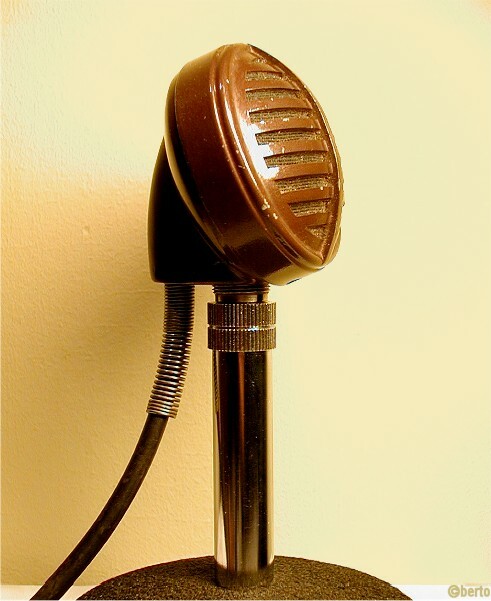 No name tag on this little mic. 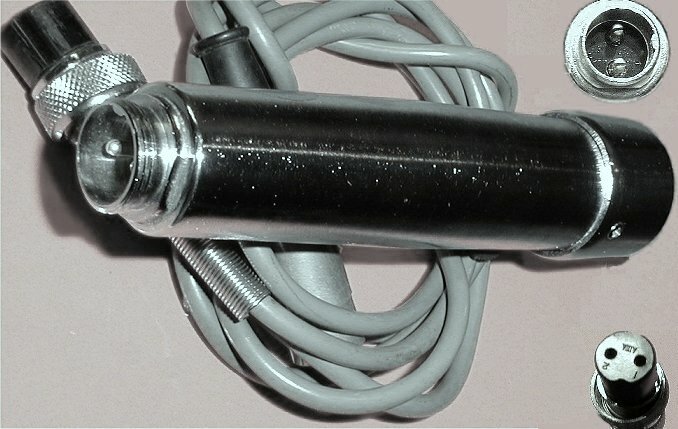 It has a screw-on two pole connector. 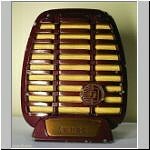 Possibly a Calrad or Aiwa M23 or one of the other japanese fantasy names (Lafayette, Shield, Philmore 100CM, Armaco, Veritas V-582A) (see Vintage Blues Harmonica Microphone Museum (note: this page takes a long time to load)). 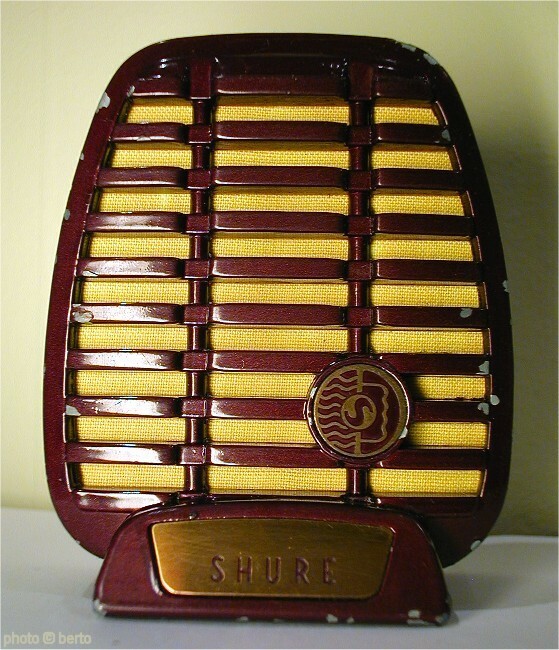 Could also be a copy of the shure "Slim-X 777". 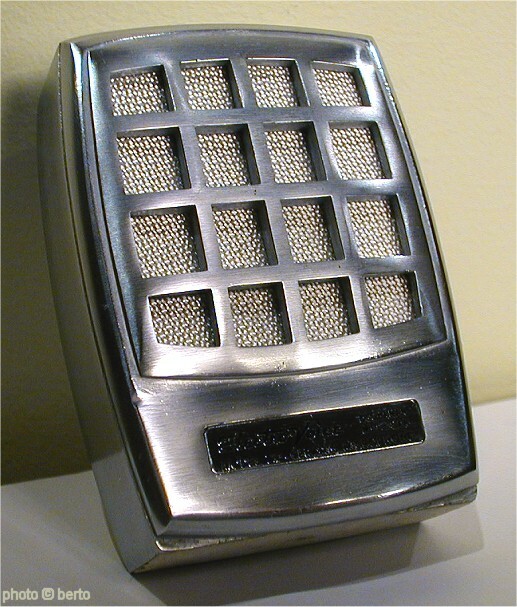 This model is from around 1963 and cost approx. 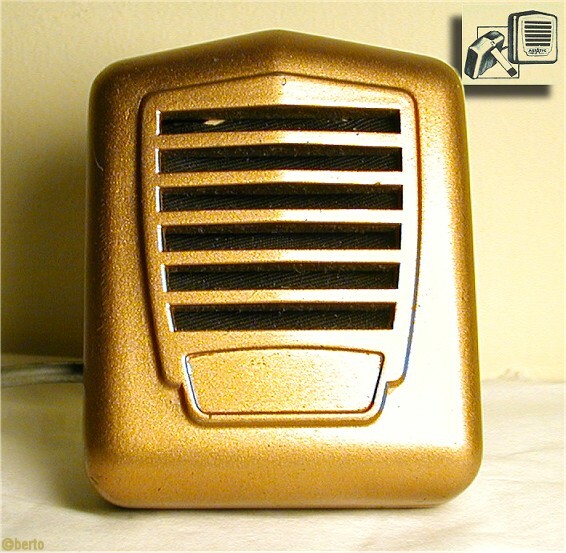 $12 then. 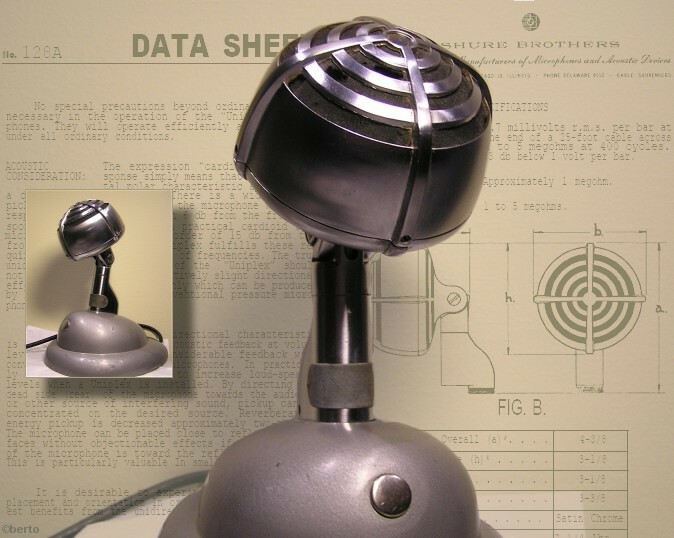 This model seams to a modernized design of the similar mic that had the same model number (and that mic was also known as Argonne AR-54, Argonne M131, Herald M24a, Fentone, Olson, Armaco, Primo M131, ...). 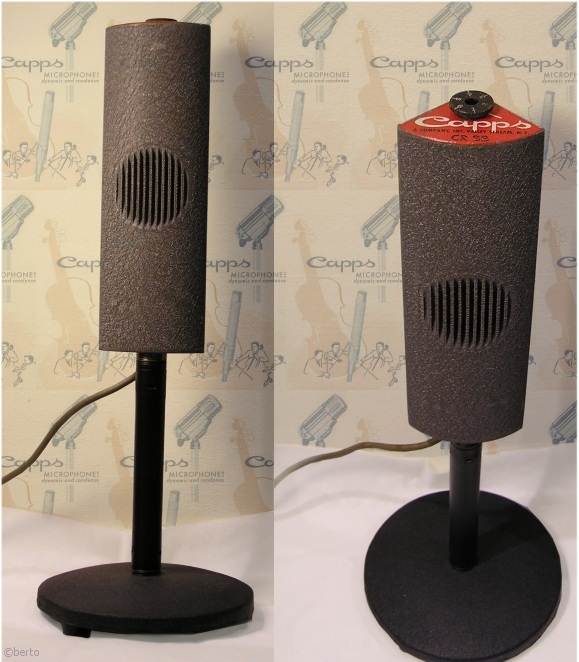 The Capps company (established by Frank L. Capps) was one of the smaller American microphone companies. 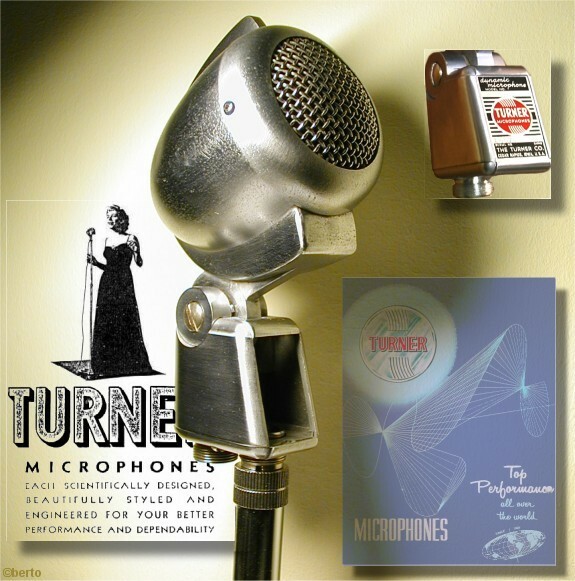 They are best known for their condenser microphones but they also offered a small range of dynamic and crystal microphones. 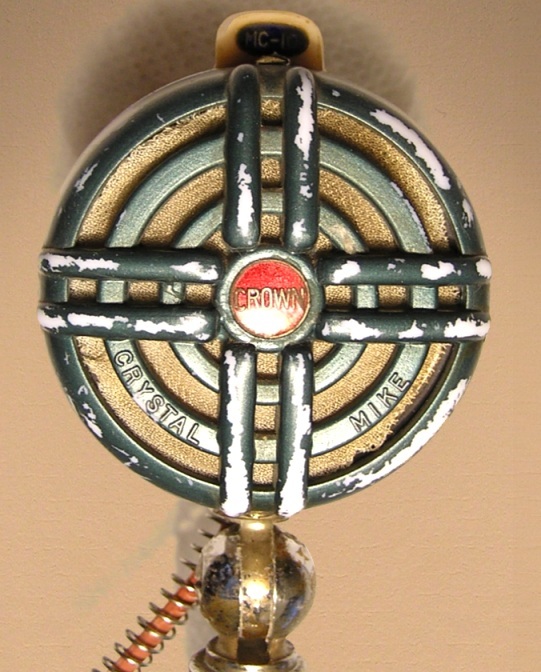 This rare CR BB has a unique design, which offers a better bass response. 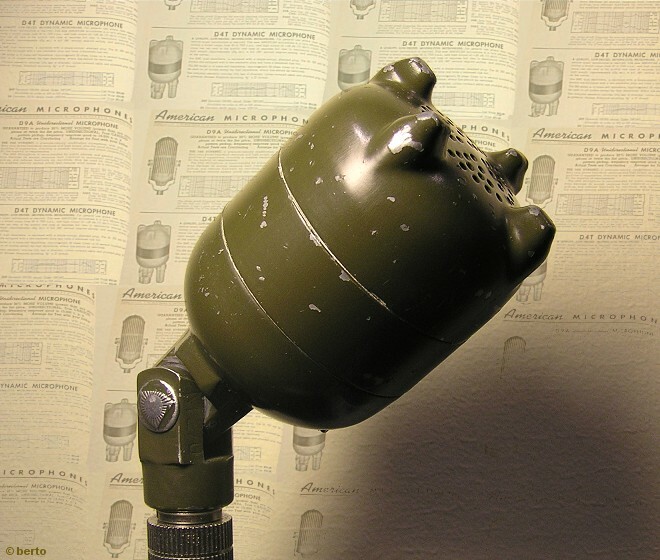 The name BB stands for Bass Boosted. 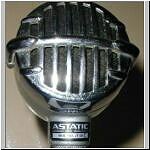 The amount of Bass boost can be controlled with the knob on top of the microphone. 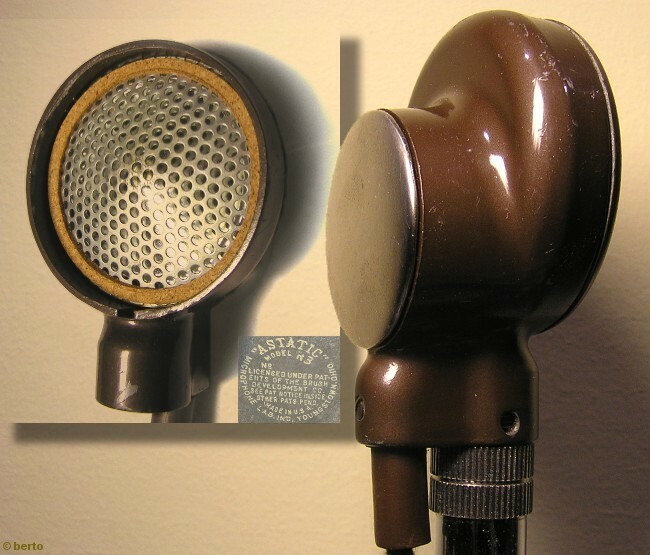 Japanese crystal microphone (also known as Philmore or (with a different color scheme) as Emblem m20 and Kent m20 a.o.). 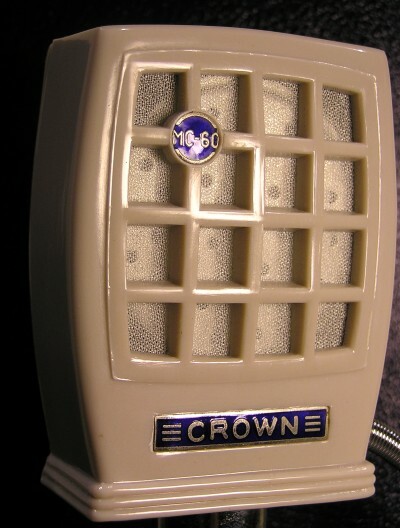 1959 List price: $ 2.95. 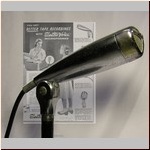 Rare Japanese crystal microphone, also sold (in different colors) under the brandname "Philmore". 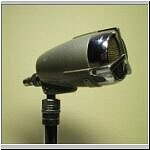 Probably from the 1960's but it does look older ! 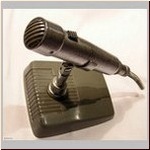 A cheap Japanese copy of the Electrovoice 915 mic. 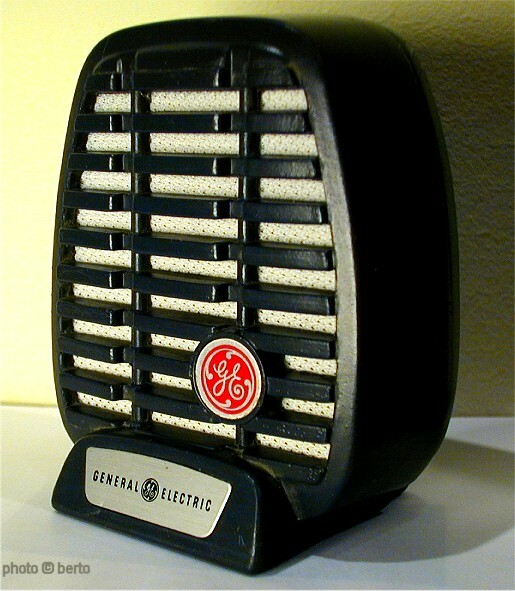 From the 'Century' line. 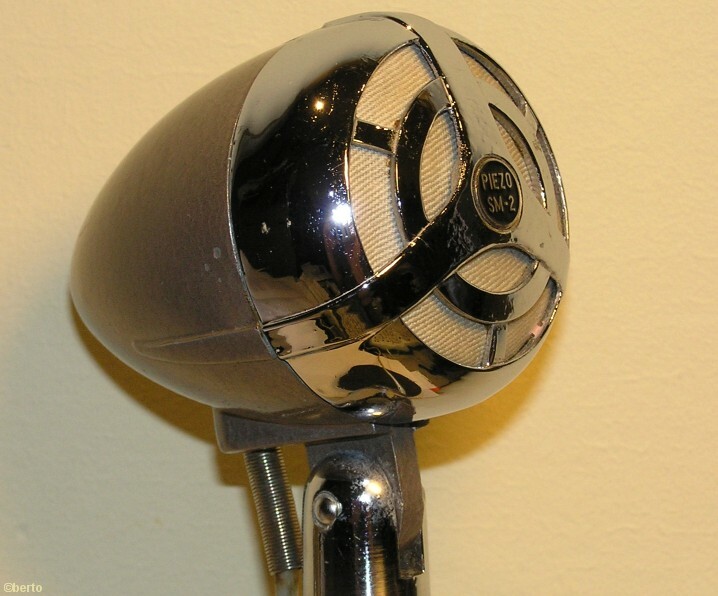 The mic was also available with a dynamic element (model 615) and a crystal element (model 915). 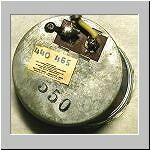 This 715 had (not has, because the element is missing) a ceramic element, with a frequency range of 80-7000 Hz. 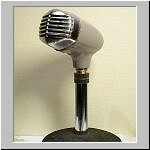 List price around $12 in the fifties. 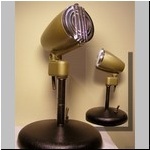 Nice design in 'satin chromium finish'. 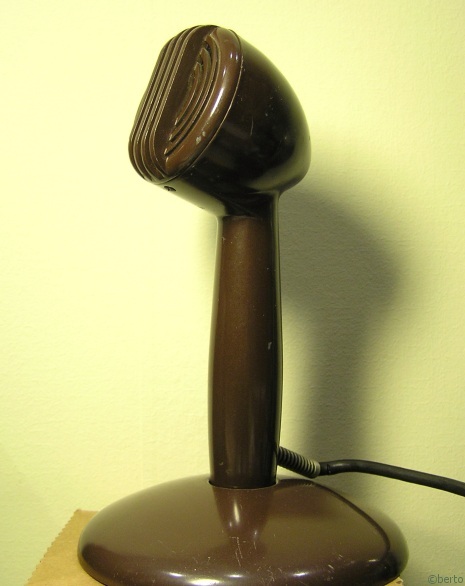 Not in excellent shape, but then it cost only 1 euro. 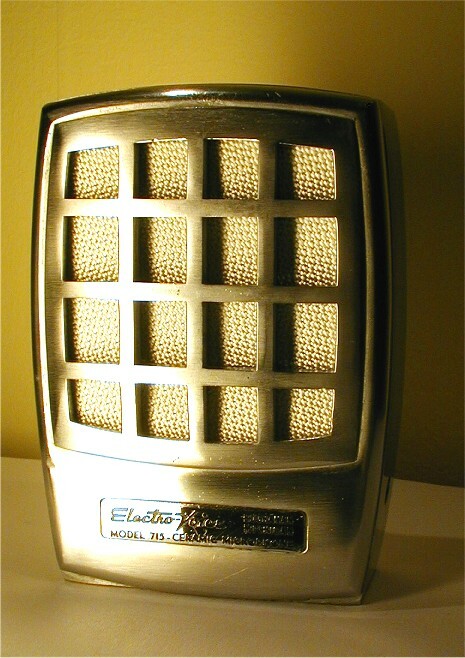 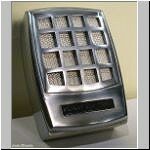 One of the "slim crystal" series of Electrovoice, introduced in the second half of the 1950s. 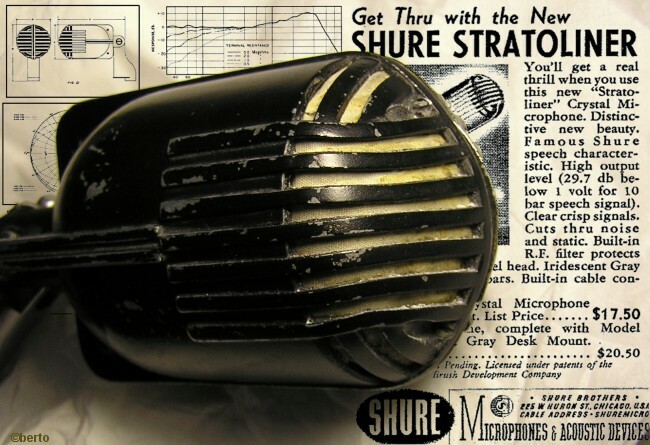 Made by Shure. 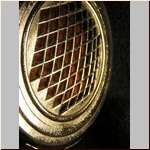 The picture on the right has a fresh piece of cloth behind the grille. 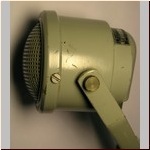 The right picture has a slightly different model, 3¼	P9052. 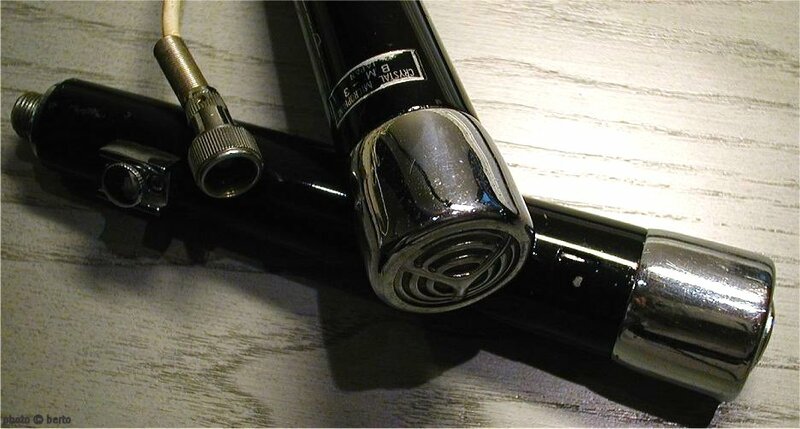 The main difference is that the P9052 has a standard Switchcraft connector, whereas the bm3 has a mini screw-on connector. 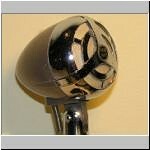 Interesting Japanes bullet microphone, crystal element. 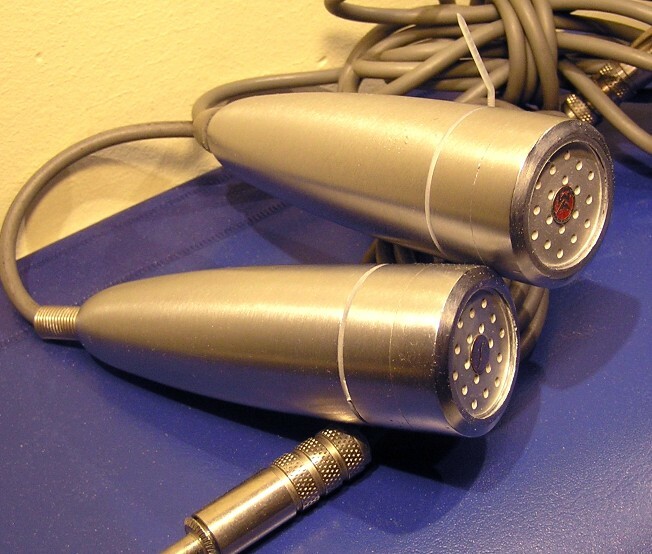 These Japanes microphones are not rare and have one or two (dual) crystal elements. 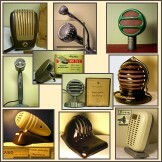 Still they are not cheap, they usually sell for $150-$200 on ebay ! 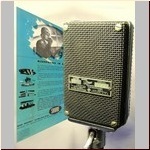 This one was much cheaper but still in excellent shape. These models were available under a long list of different names, shown on the right are the Calrad, Fen-tone M18, Herald M102, Crown MC80 and Aiwa M18. 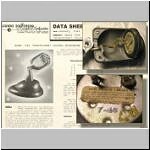 For a complete list see here or see here. 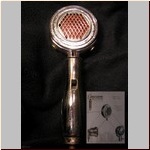 1960's list price: $4.95 ! 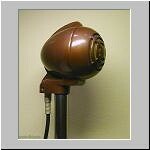 Identical to the Argonne, Amd and Aiwa-m120 and probably another dozen of japanese fantasy names. 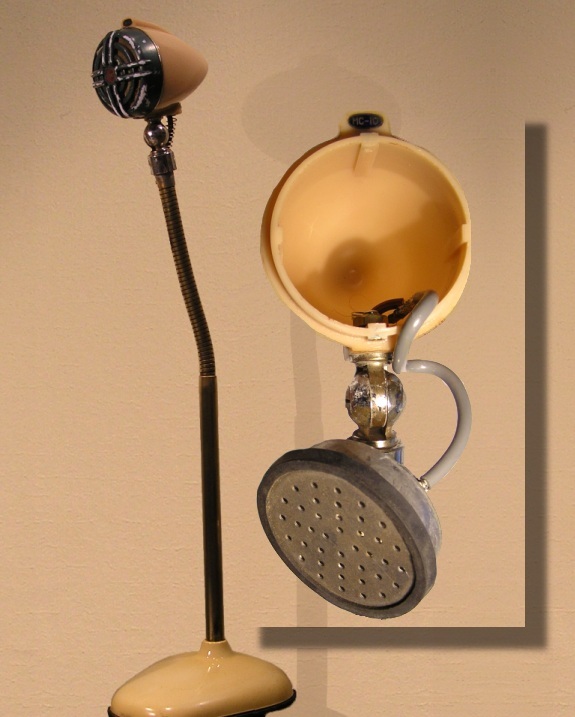 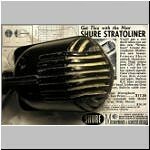 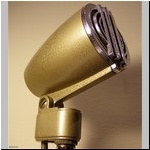 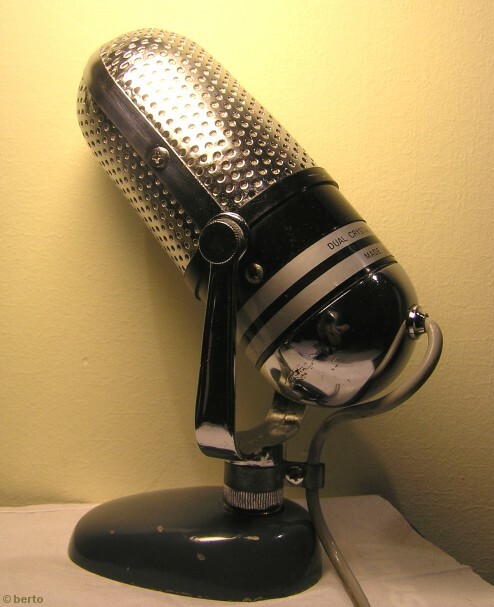 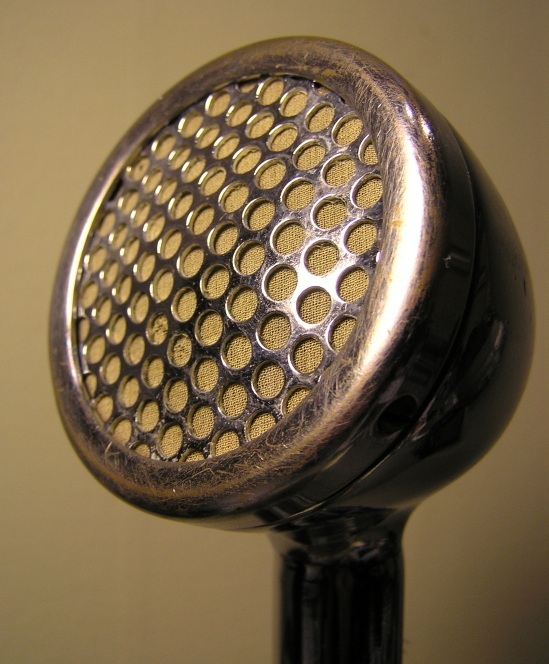 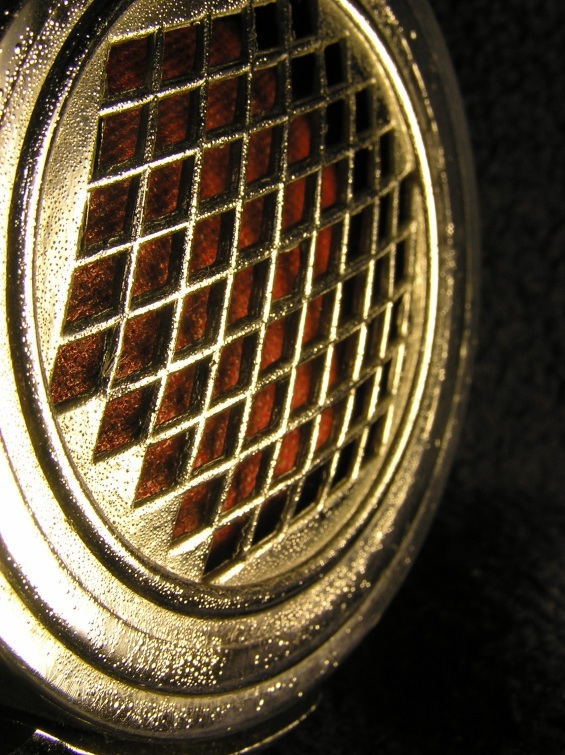 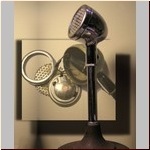 One of the oldest Shure crystal microphones (around 1937) and an inspiration for e.g. 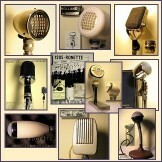 Astatic and Ronette. 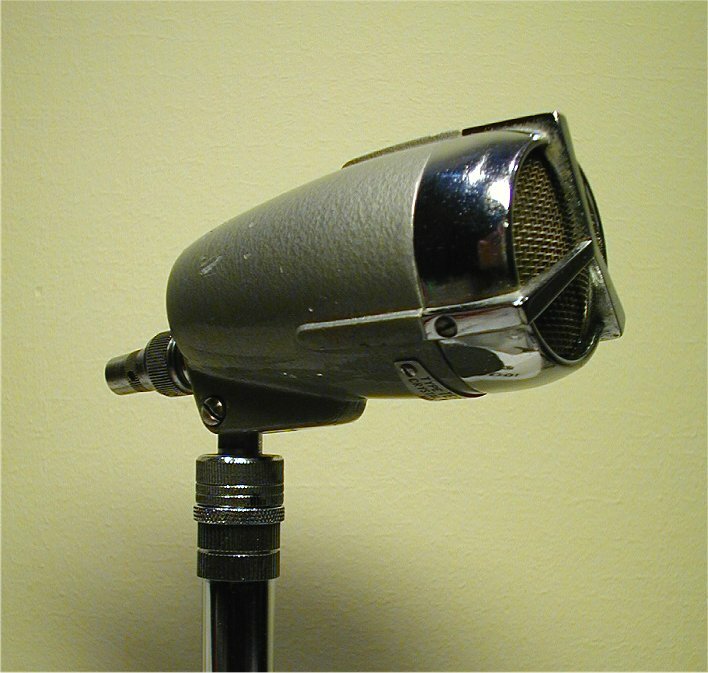 Also known as the Stratoliner, model 708A or 708SH. 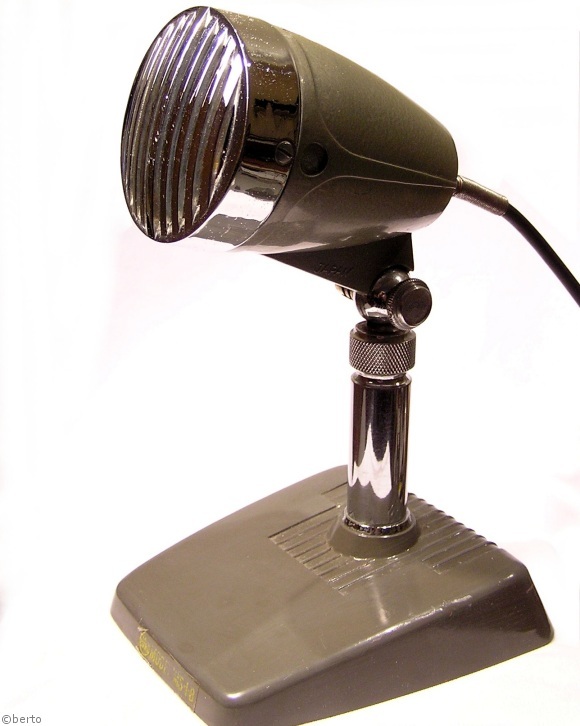 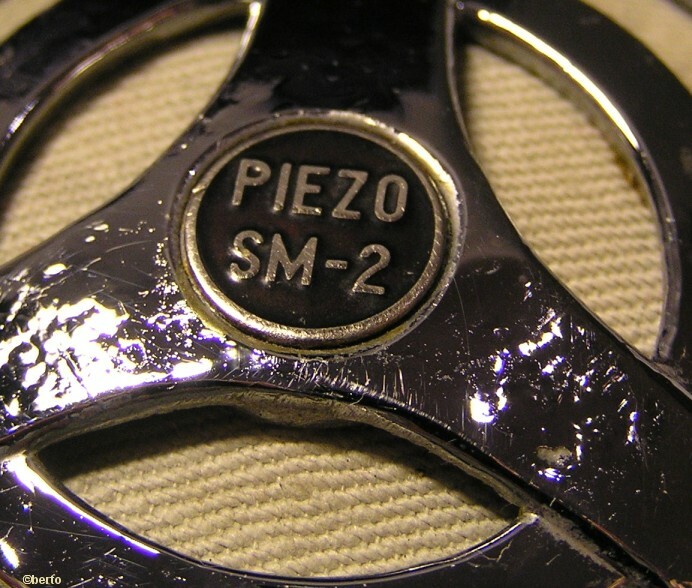 The model was introduced in 1940 and stayed in production till 1958. 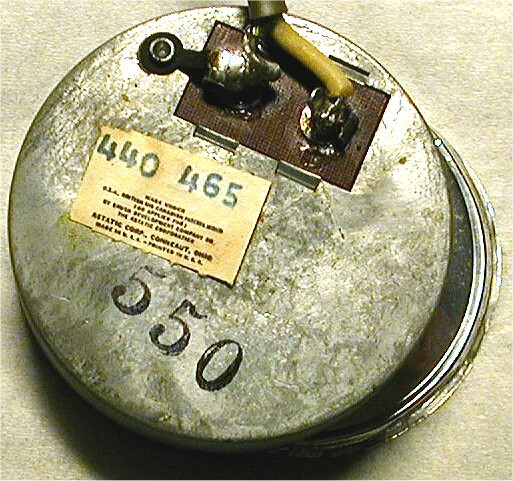 The element has the date "7-46" stamped on it. 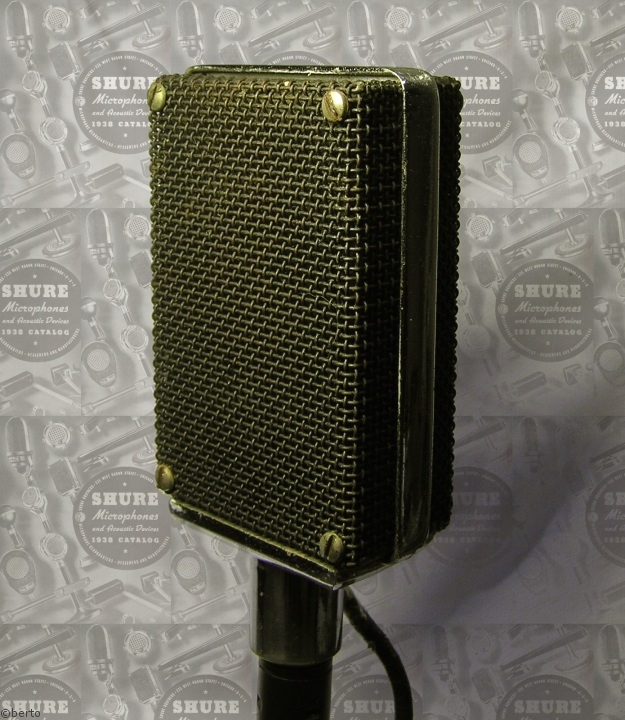 The case is attractively streamlined for improved acoustical performance and modern appearance. 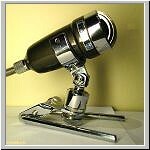 I was not shure if the black paint was original and because it was in a bad shape, I decided to repaint it in silver gray. 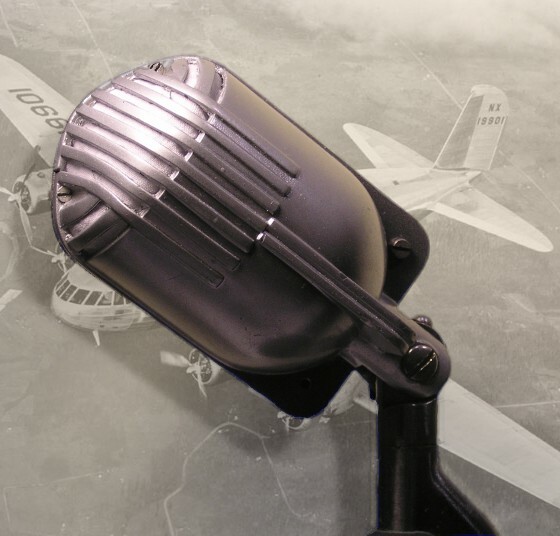 This stratoliner is shown here with the Boeing 307 'Stratoliner' in the background (also known as "the flying whale"). 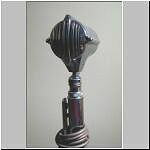 A semi directional crystal mic (although this one has no longer an element inside), in 'metallic burgundy-red'. Freq. 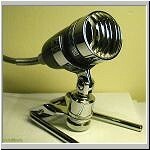 response 60-9000Hz. 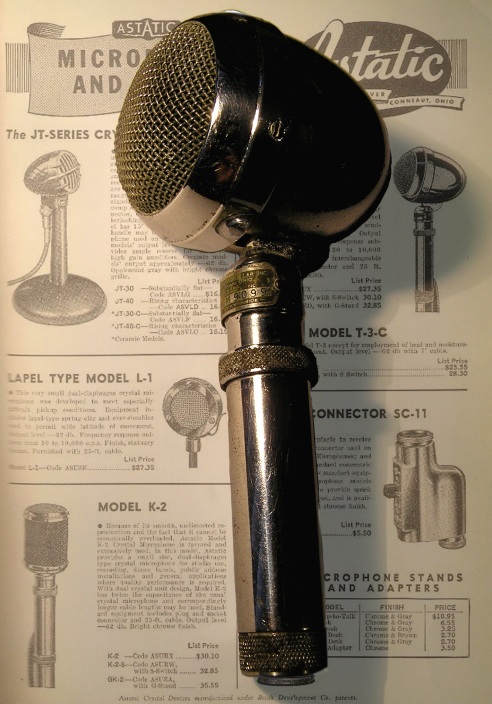 original data sheet (The model 710s is similar but with an extra talk-switch). 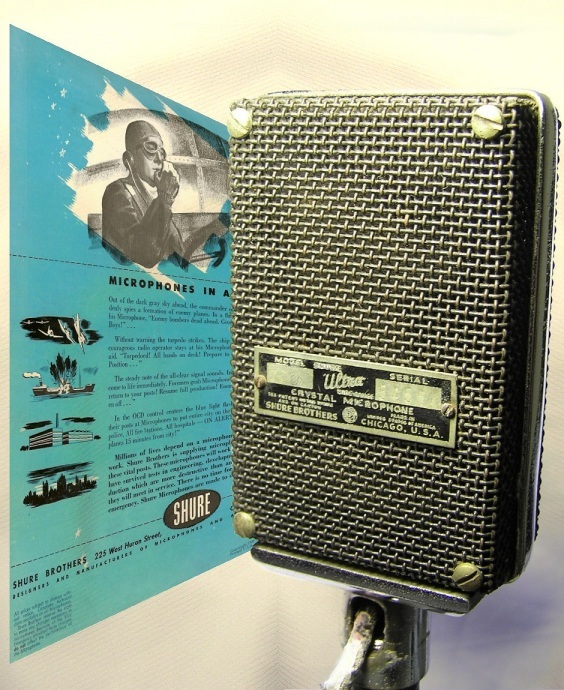 The model was introduced in 1949 and available until 1970 (and was pretty cheap, about $7). 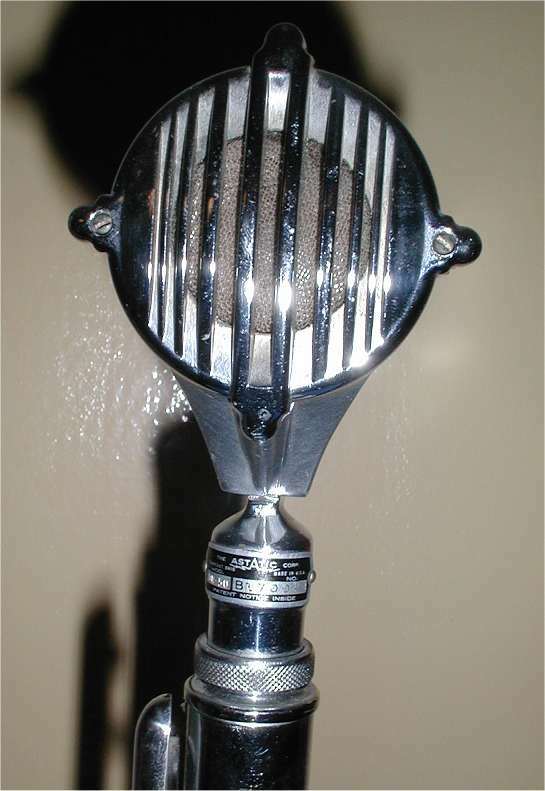 Mid 1940s crystal microphone, one of the strangest designs ever. 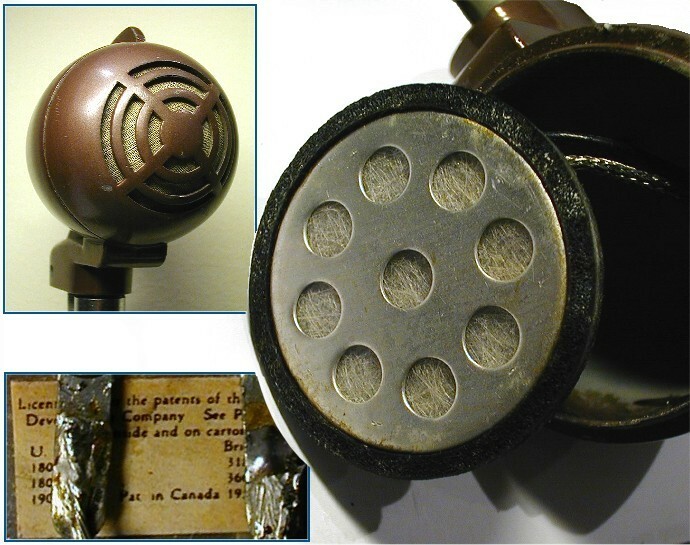 Model 730B "Uniplex" Crystal Microphone ( original data sheet). 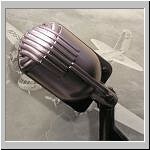 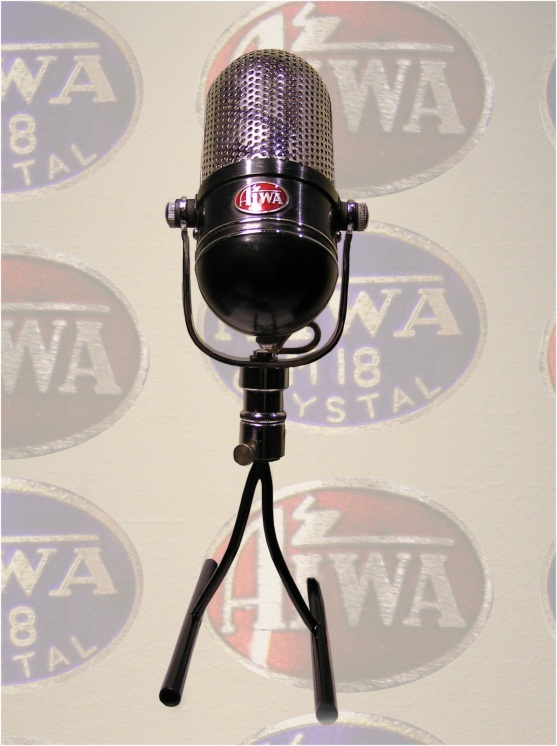 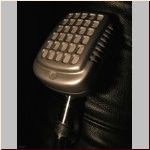 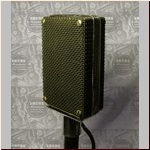 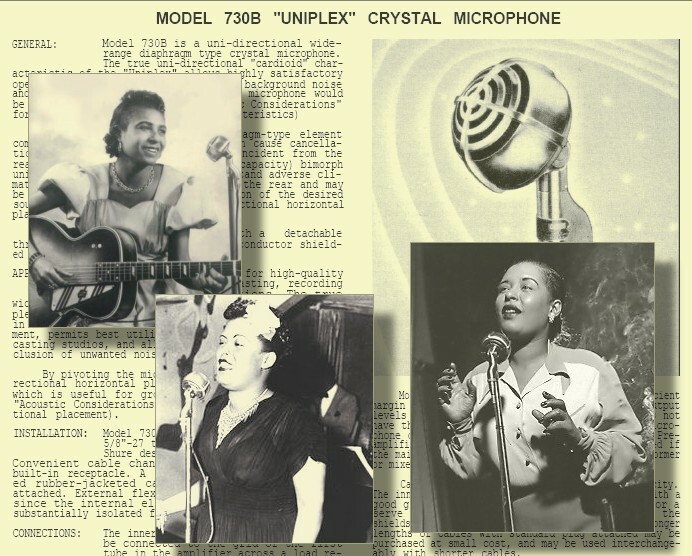 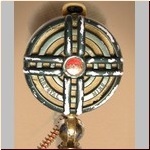 Model 730B is a uni-directional widerange diaphragm type crystal microphone. 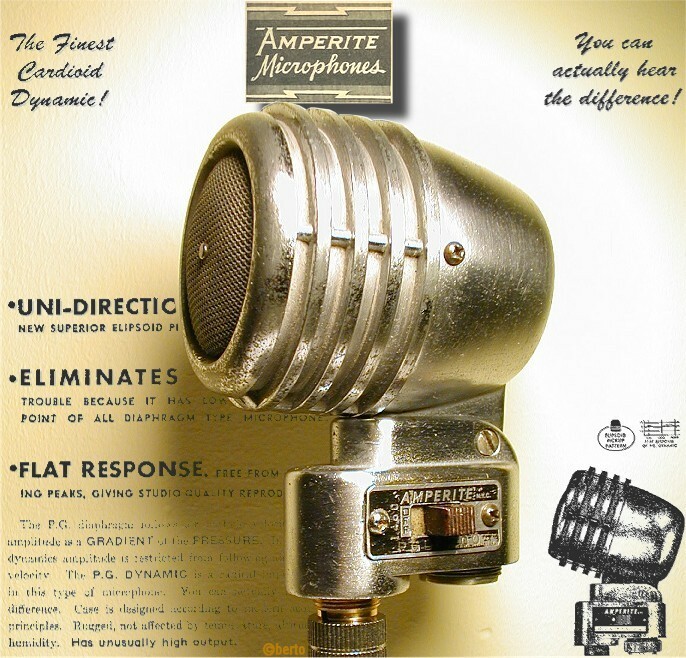 The true uni-directional "cardiod" characteristic of the "Uniplex" allows highly satisfactory operation under adverse conditions of background noise and reverberation where a conventional microphone would be practically useless. 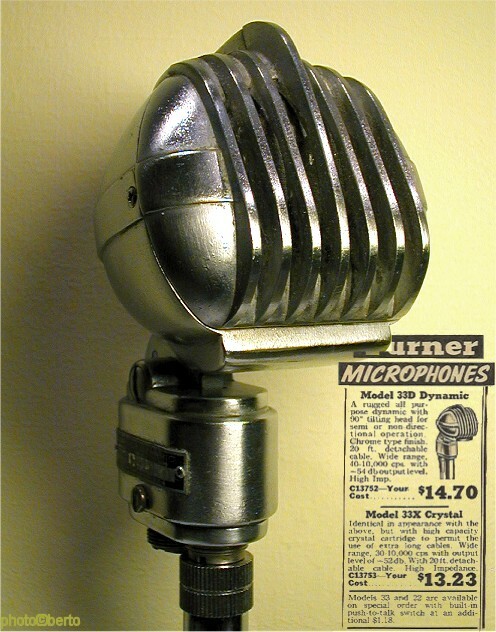 The model 730B was introduced in 1945 (but the identical model 730A in 1940). 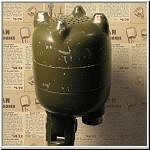 This one has 9-46 stamped on the (dead) element. 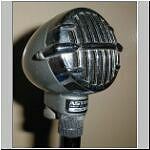 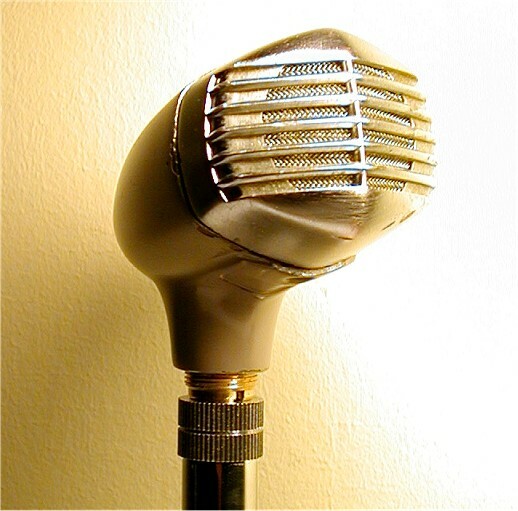 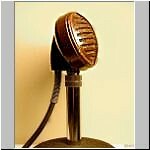 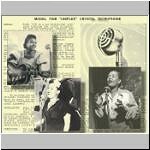 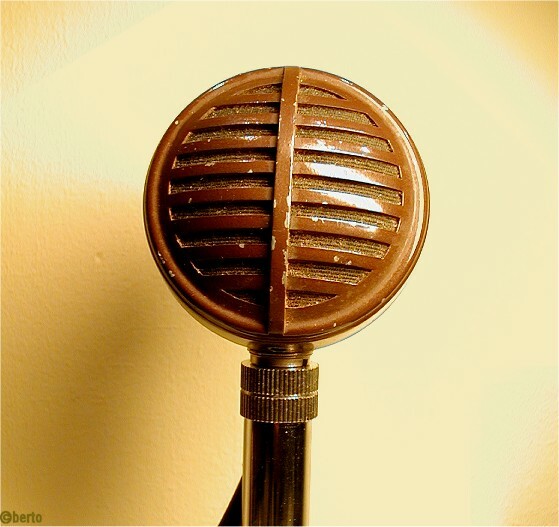 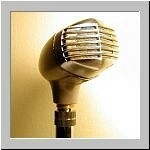 This model is sometimes called the "Billie Holiday" mic, but it can be called the "Memphis Minnie" model just as well. 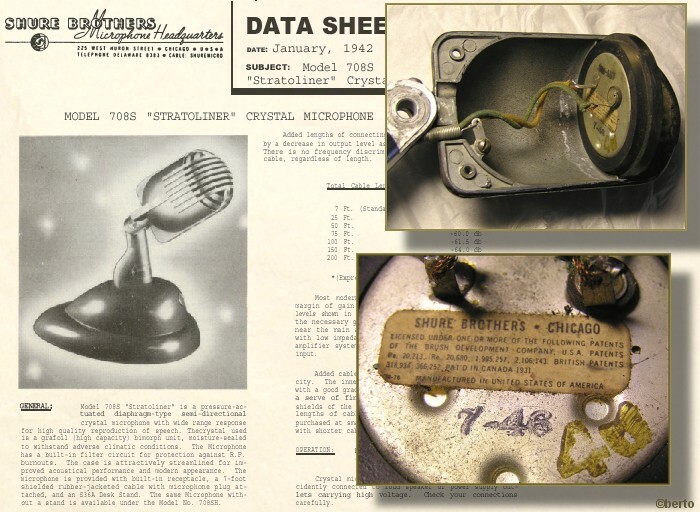 Model 737A "Monoplex" Crystal Microphone ( original data sheet). 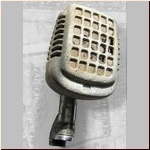 Normally I only try to repair or repaint a microphone when it really needs this. 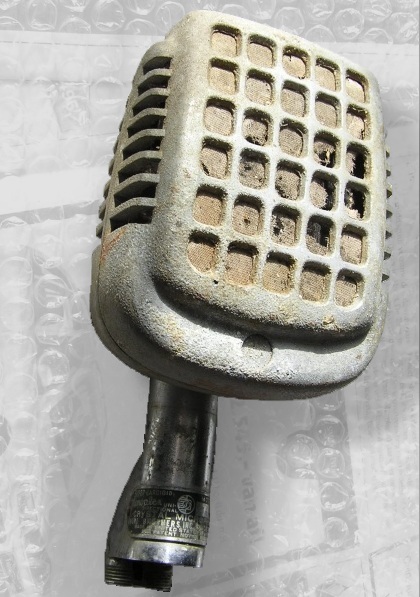 This is such a case, it looks like the microphone was buried in the ground for sixty years or so. 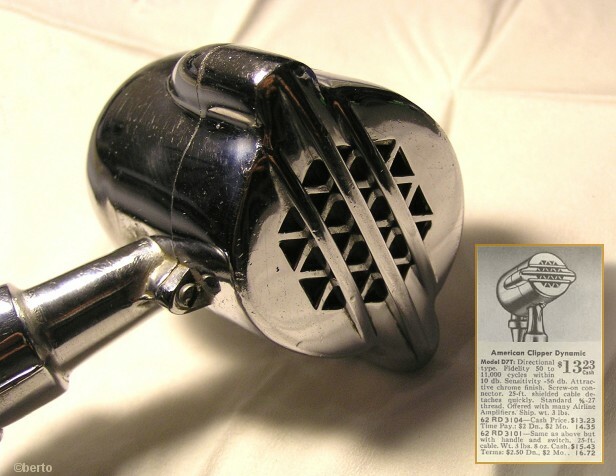 Maybe not the ultimate restoration, but the best I can do. 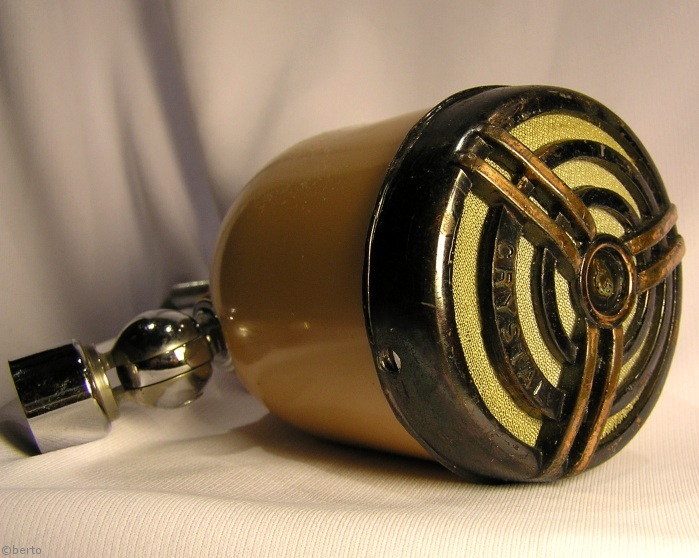 It definitely looks a lot better now, and no need to wear latex gloves before touching it. 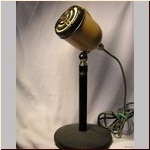 I believe this model was introduced in the late 1940's and stayed in production until the 1960's. 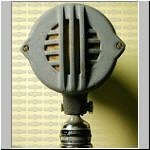 There is no name tag on this dynamic microphone, but I believe it is (one of the first) Sony microphones. 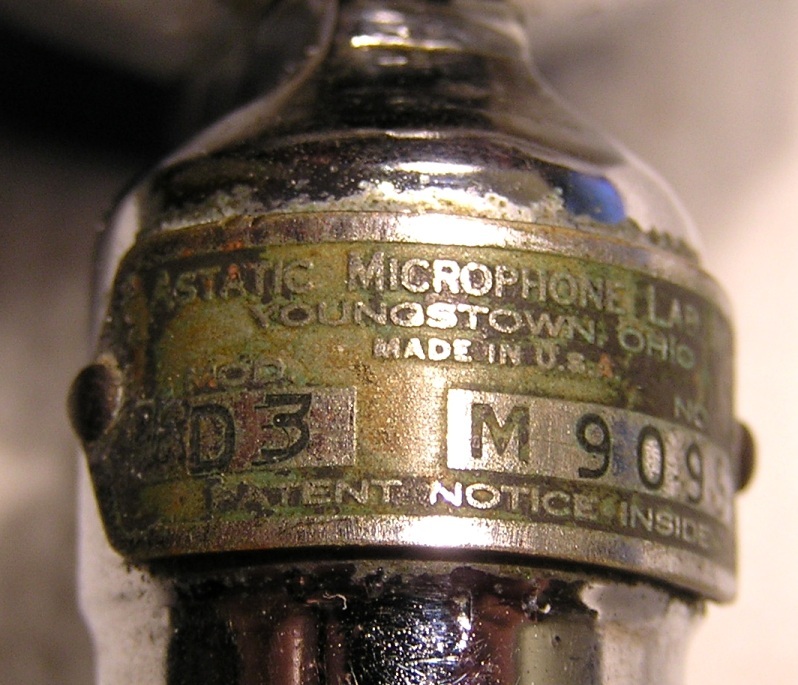 This one seems to be not only identical to the Lafayette pa-19 and the Argonne ar-55, but in fact all three names where printed on the box (although I don't have the box). 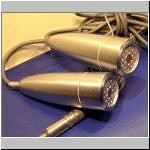 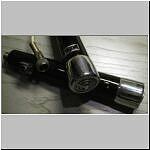 It is a dynamic microphone, impedance 40 K ohms. 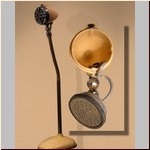 "Awarded a bronze medal at the Brussels World's Fair. 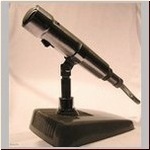 Probably the most outstanding dynamic microphone under $100 in the field. 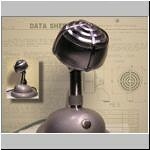 Semi-directional characteristics and exceptionally smooth response from 50-12kHz." 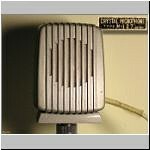 Crystal microphone, made in Japan. 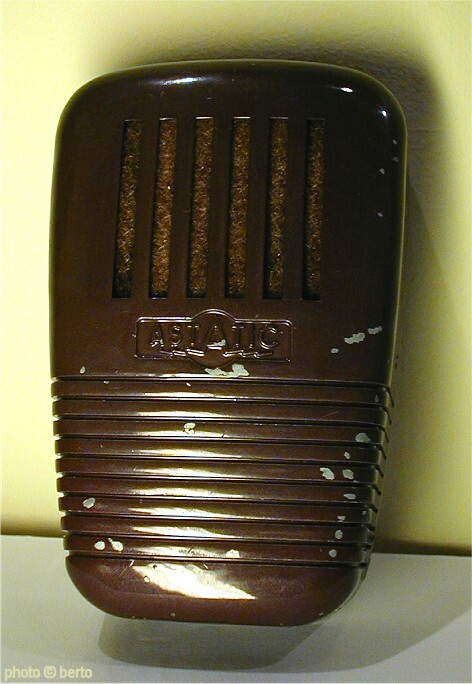 The foam inside was completely gone. 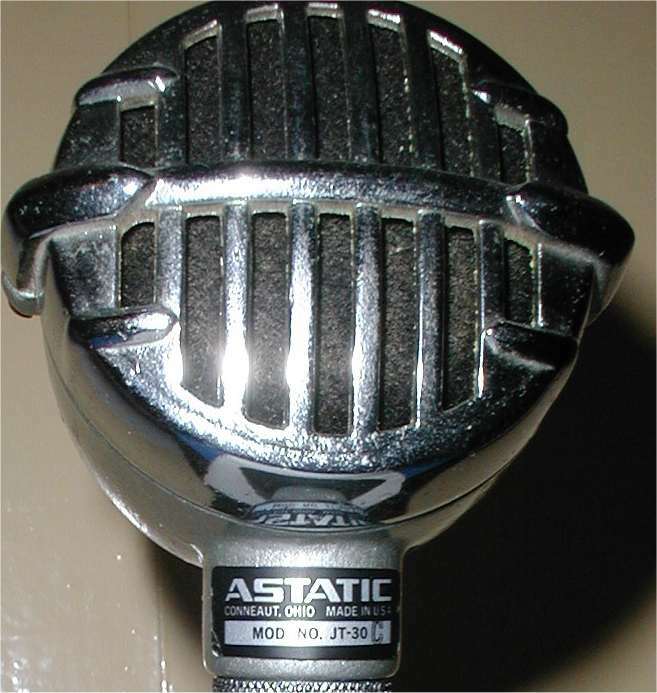 (Note that the greenish colour in the picture is actually 'astatic' grey). 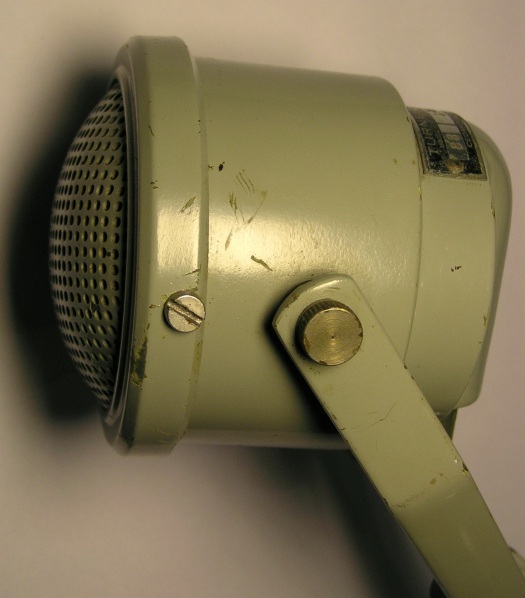 Identical to the Archer 91L130 (except the colour). 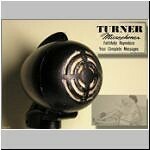 The cheapest in the Turner 'Economy' line, this one has a crystal element and an 'attractive brown enamel finish'. 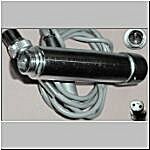 List price was $6.38. 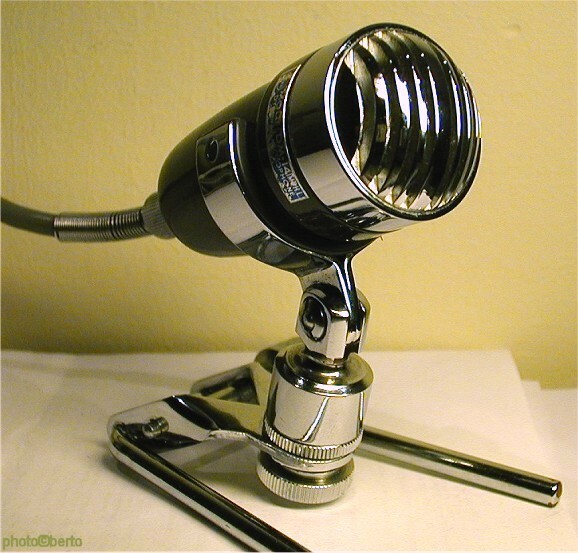 The mic was also available with a dynamic element (BD) and with a chrome finish instead of brown (CX and CD). 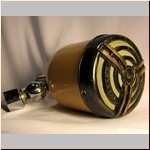 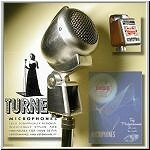 There is one NOS Turner-BD offered on the internet for $395 ! 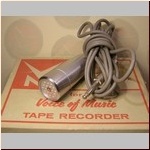 (not a very realistic price IMHO). 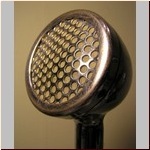 Freq. 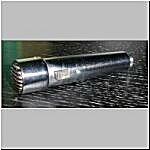 range of 60-7000 Hz. 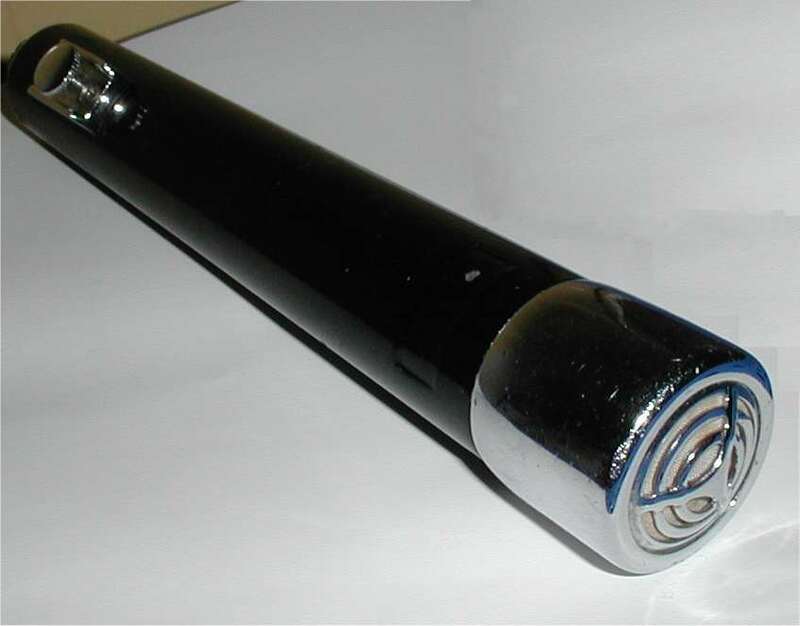 Another one, this one looks like it had a black paint job. 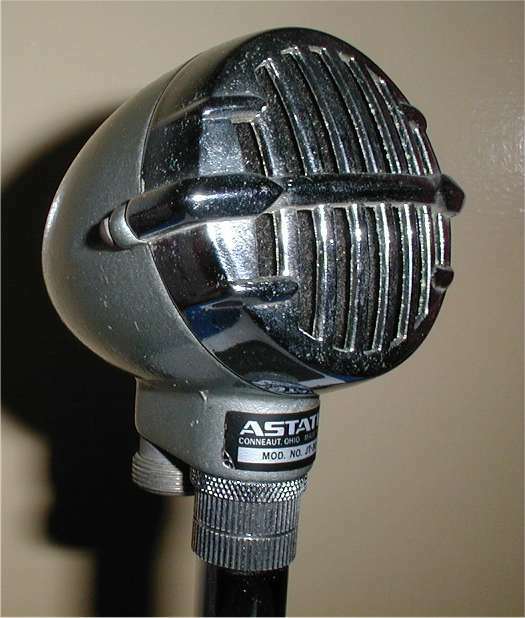 I put a shure 99B86 controlled reluctance element in this one, and it transformed the mic it a heavy, bad looking tone monster (in the hands of someone who can really play harmonica [not me!]). 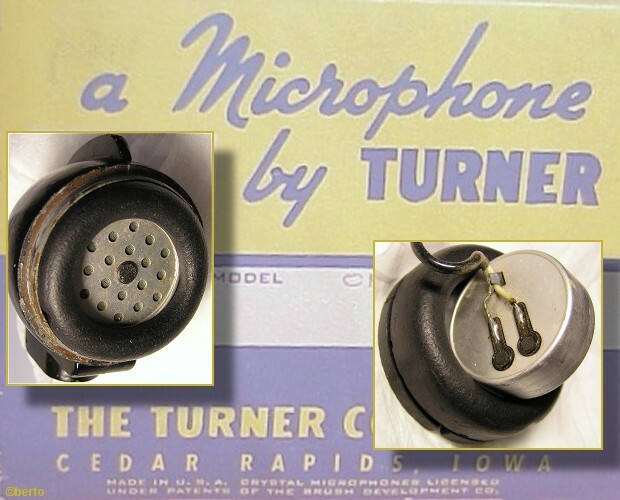 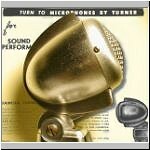 Turner produced 80000 microphones in 1952(and a thousand embalming machines) according to Turner story and the model 22 was one of the most popular models. 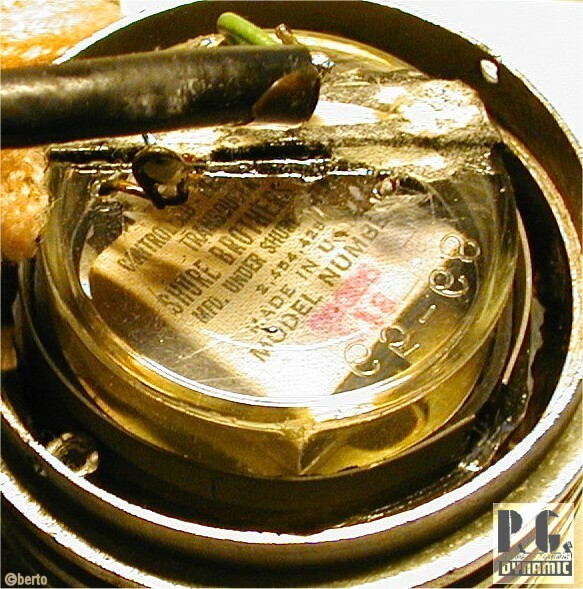 This one has the front tag and internal wiring missing, the crystal element is present. 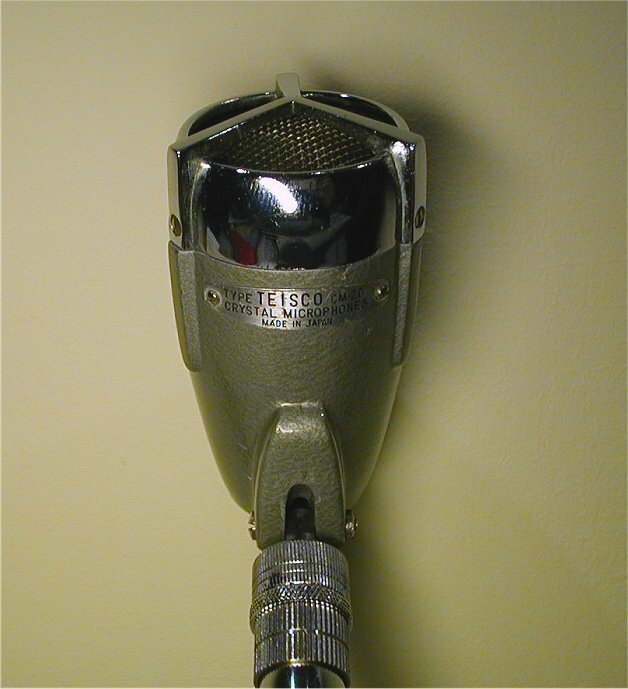 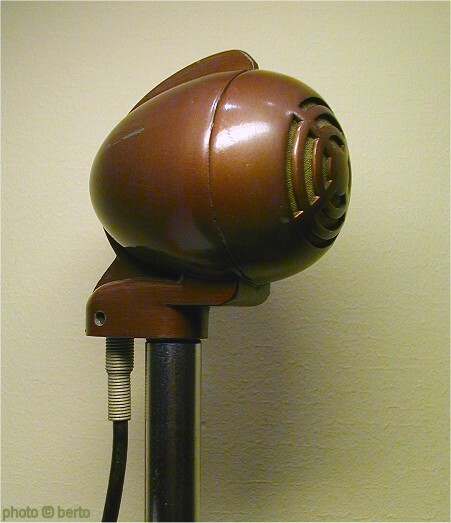 Later this model was also available as a dynamic mic. 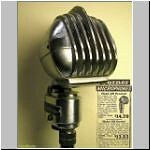 1945's list price: $10.88. 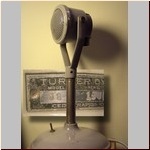 Another Turner, this is the dynamic model. 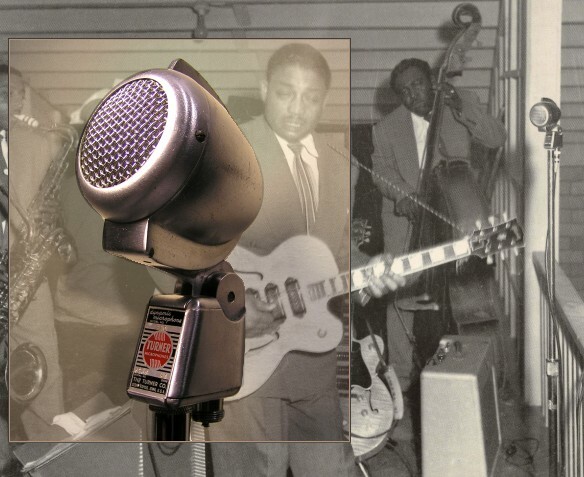 The photo of Lowell Fulson was taken by Arkansas photographer Geleve Grice in Pine Bluff in the 1950's. 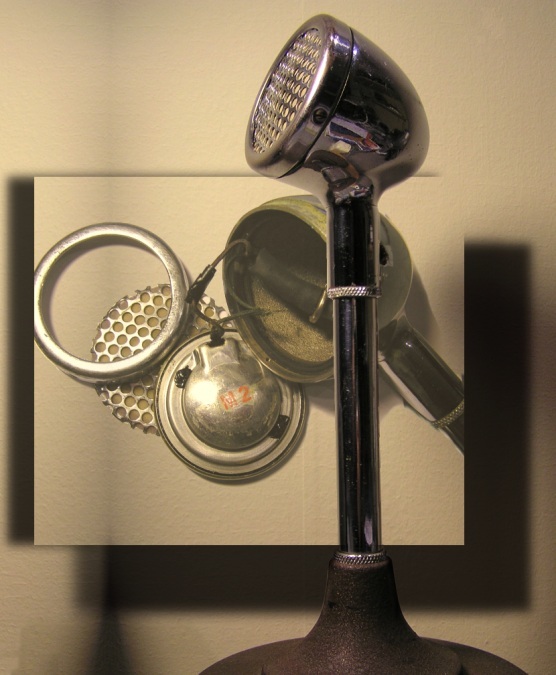 (From the book A Photographer of Note). 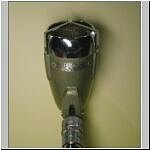 "A rugged all purpose dynamic with 90°r; tilting head for semi or non-directional operation. 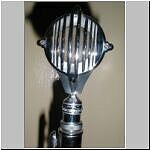 Chrome type finish." 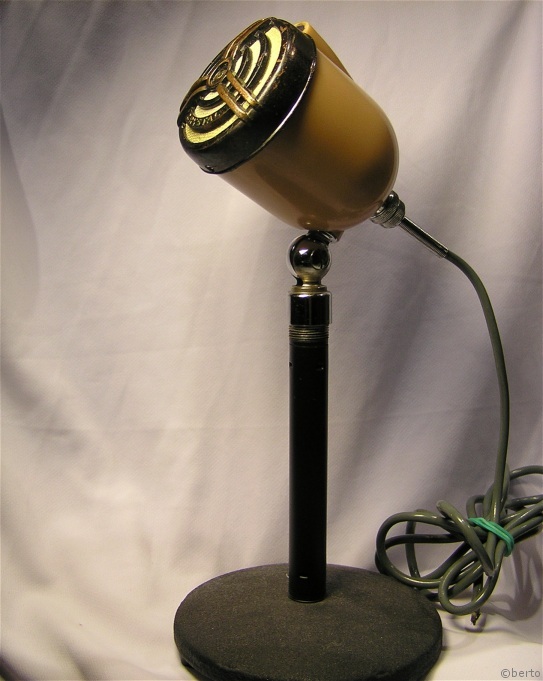 It's been in production for some thirty years: 1945's list price: $14.70. 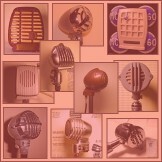 Freq. 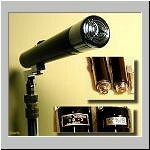 range of 60-7000 Hz. 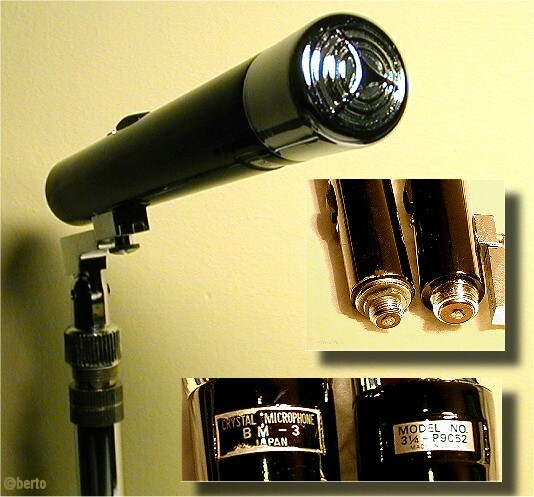 -54db output level. 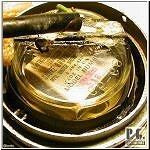 Hi Imp. 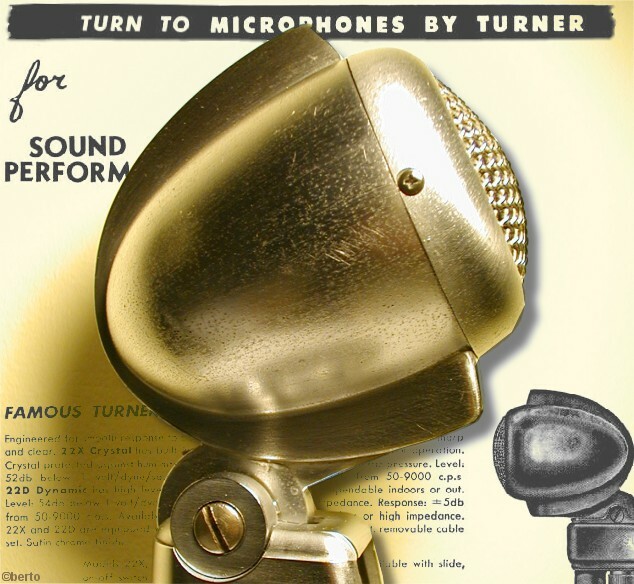 For some reason these Turner 88-s are not as common as the models U99 and U9S. 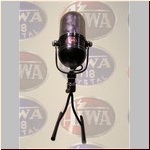 It also resembles the (rare) model 66 exept this 88 is a dynamic mic whereas the 66 is a crystal mic. 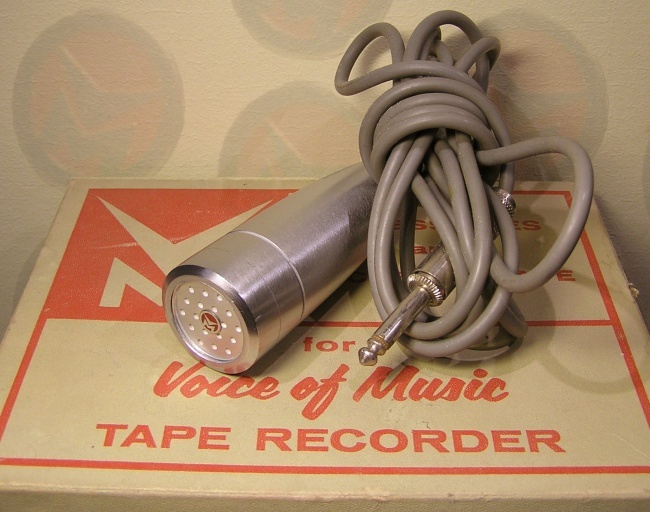 According to VM enthusiast, this model (8742 and later reissued as 15535) came with the reel to reel recorder model 714, and according to the specs it was made by Ronette. 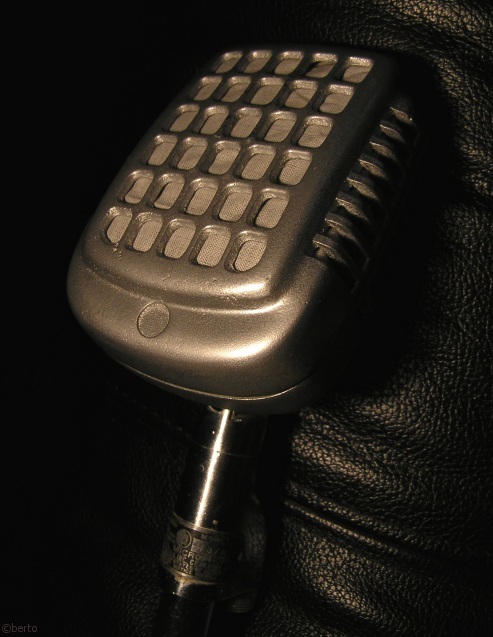 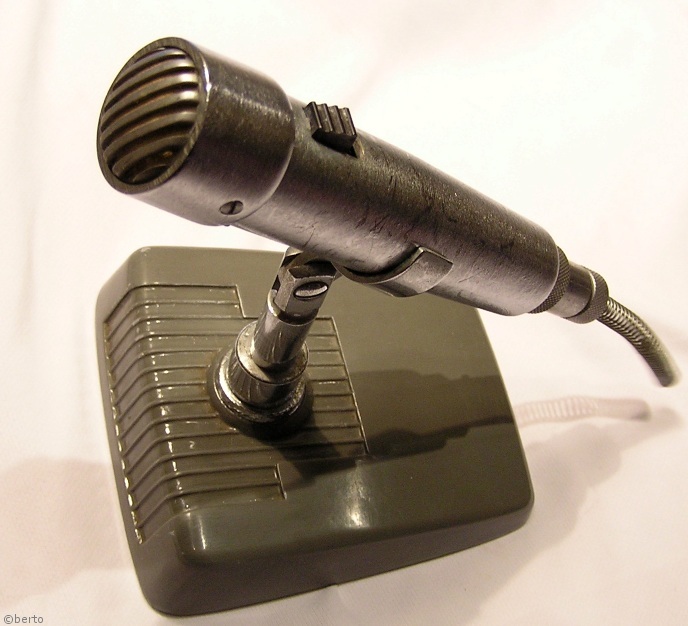 However, it is identical to the model 1402, which is a ceramic microphone. 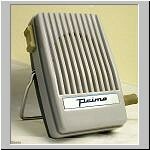 The same model was also sold under different names (Philco, Silvertone). 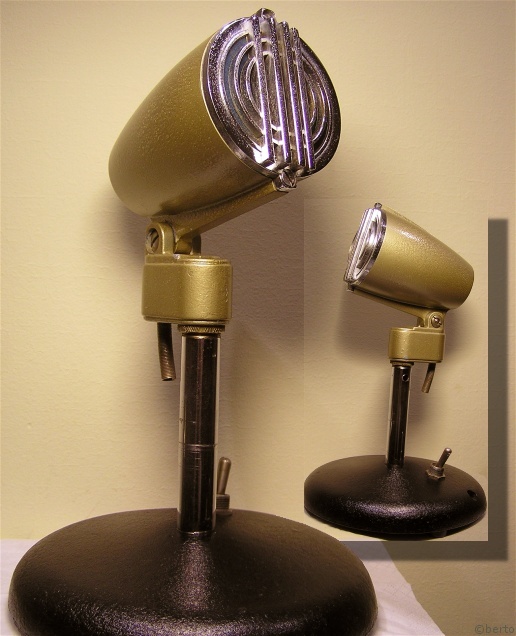 The one on the left is a Silvertone. 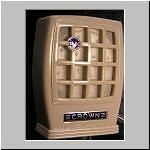 It is also not clear if all these variants have ceramic elements, these things are very hard to open! 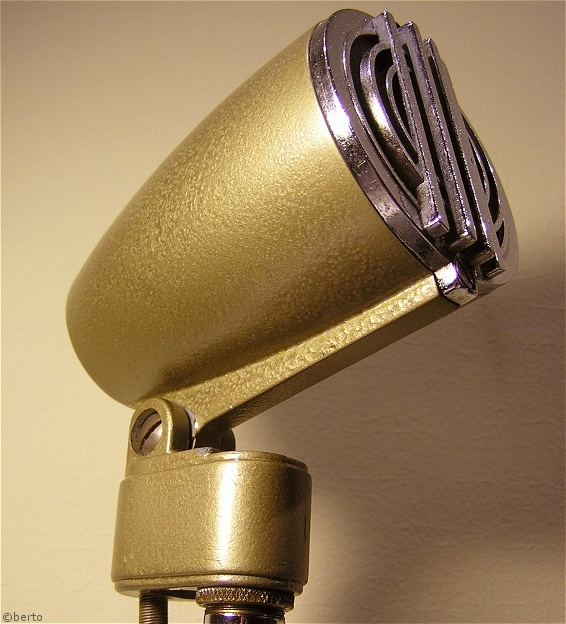 A mystery microphone. 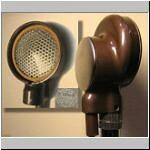 It could be of European origin as well (French) but the shape looks not unlike the Japanese Rion microphones. 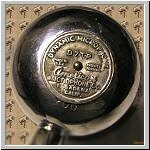 Maybe someone recognizes the "M2" element ??? 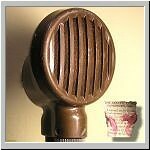 Berto's Own Microphone Rarity Index. 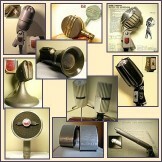 This is my own totally un-scientific rating of the rarity of the different microphones. 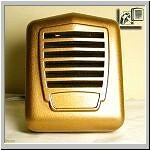 It is based on (a) what is offered on vending sites, (b) what is in other collections, (c) how much info can be found with Google and other search engines. 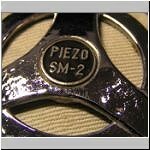 A model gets only the top rating if I have never seen or heard of another one of this model in existence. 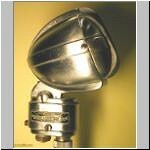 Of course, it does not necessarily mean that the rarest items are much more expensive than the more common models! 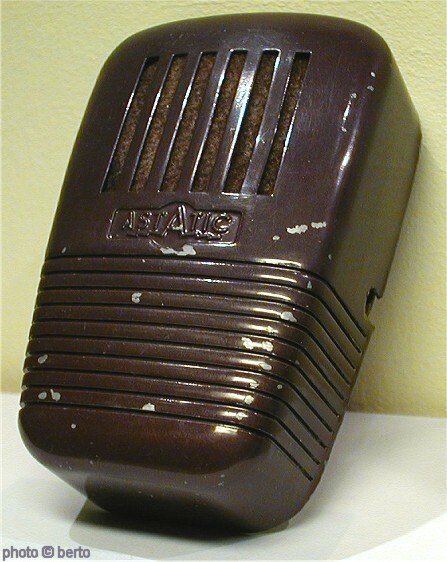 * * * * * Rare ! 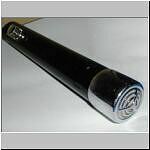 * * * * * Mega Super Ultra Rare ... at least that is what I think !